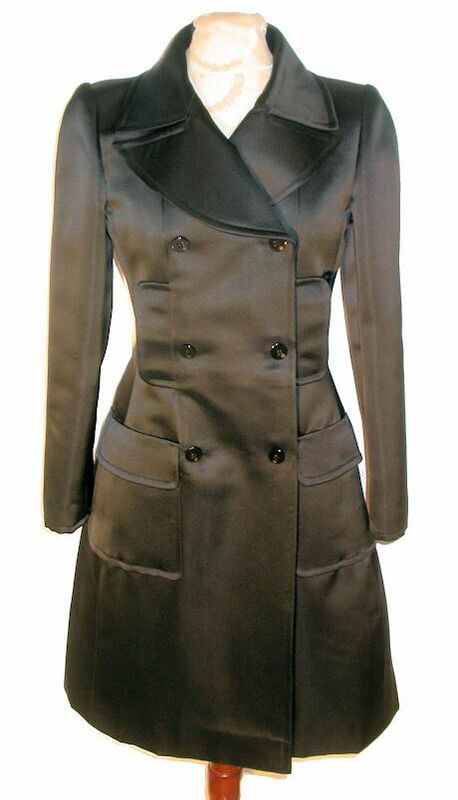 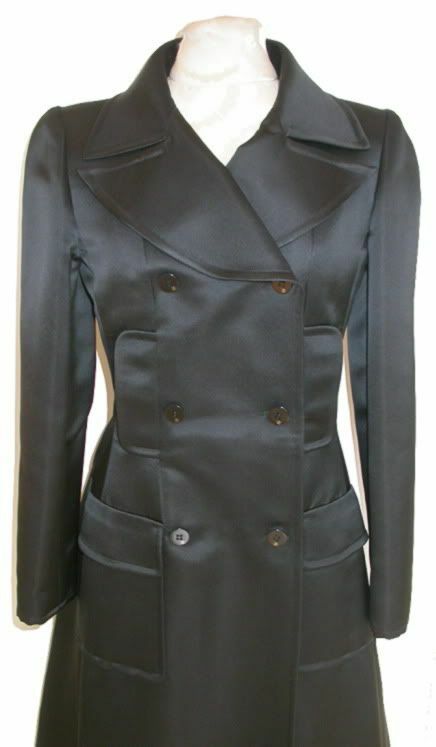 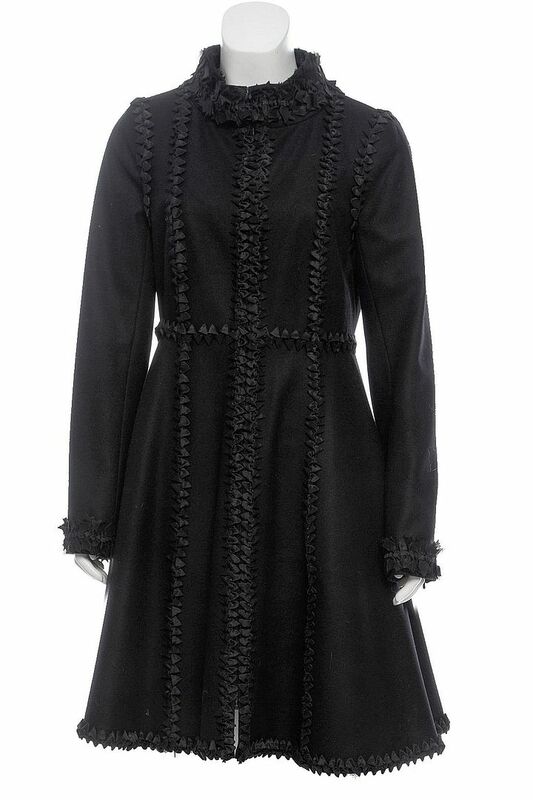 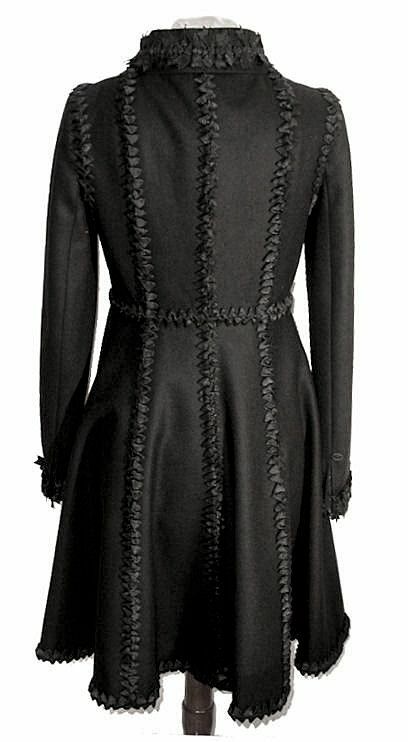 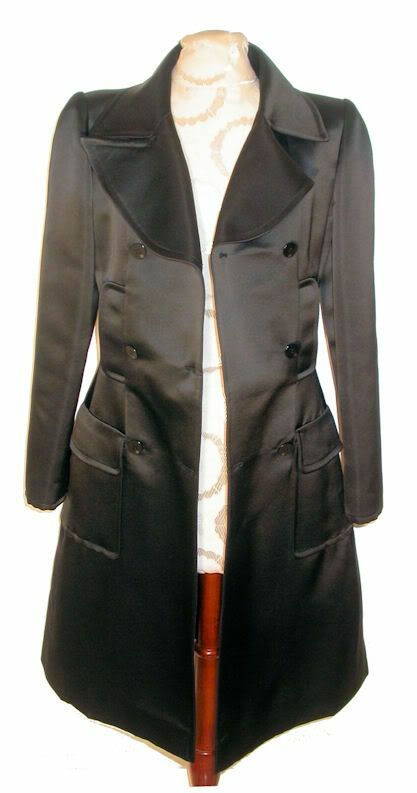 Brand new with tags, from the 08A Paris Londres runway collection, this $18,000 (with tax) black cashmere/wool blend princess coat/dress is the most stunning piece of the entire collection. 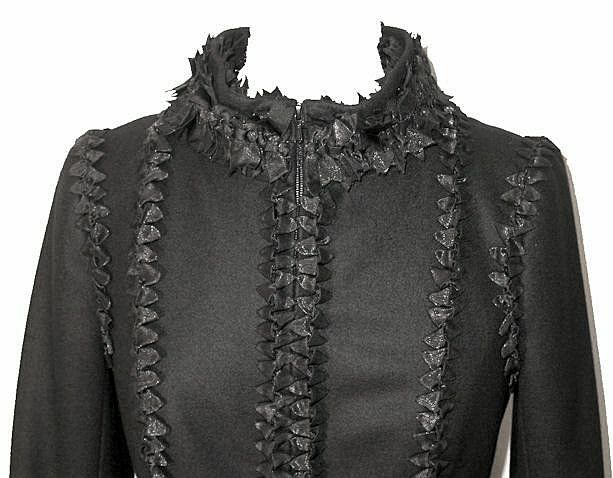 The structure and detailing are all HAUTE COUTURE from the structure of the double sided origami ribbon collar to the hidden origami detailed pockets, to the multi-paneled cut that hangs absolutely perfectly! 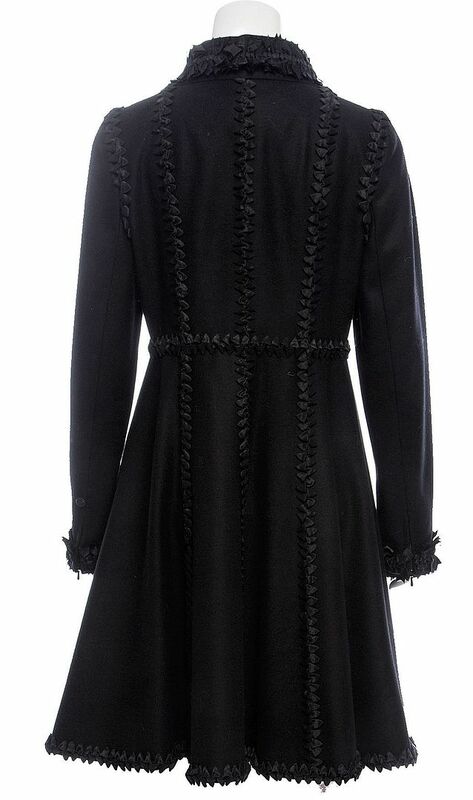 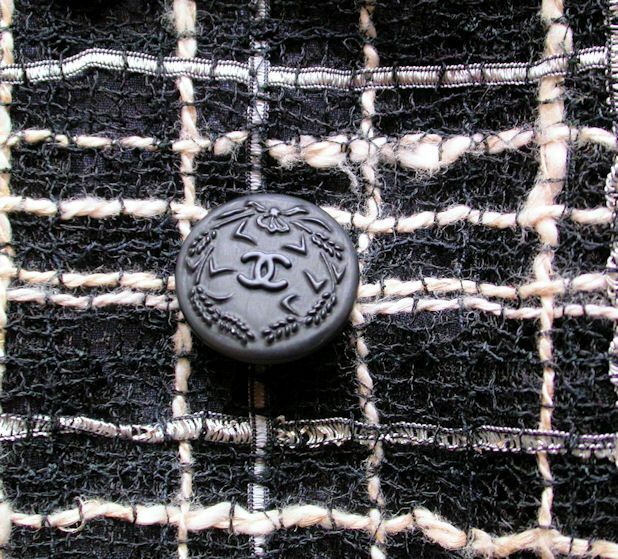 TIMELESS, totally refined, and Chanel Luxe, the coat zips up the front and can be worn as a coat or a dress. 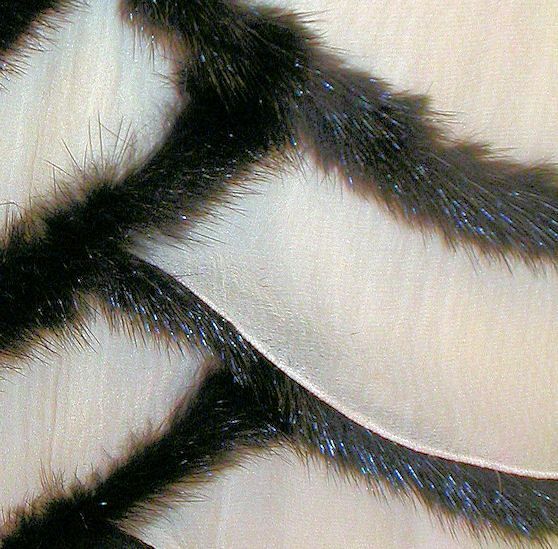 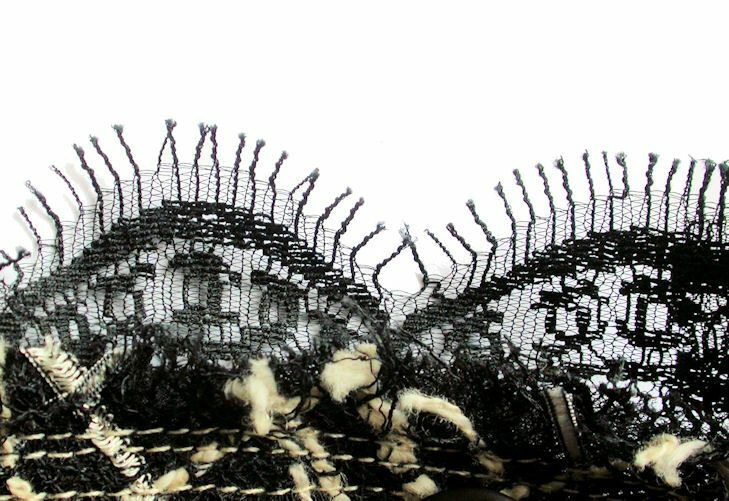 In MINT from the 2005P collection, this PHENOMENAL black/white featherweight spider web summer tweed in a silk/cotton blend is interwoven with tule, yarn, fringe, confetti, and ribbon and trimmed in black French lace. 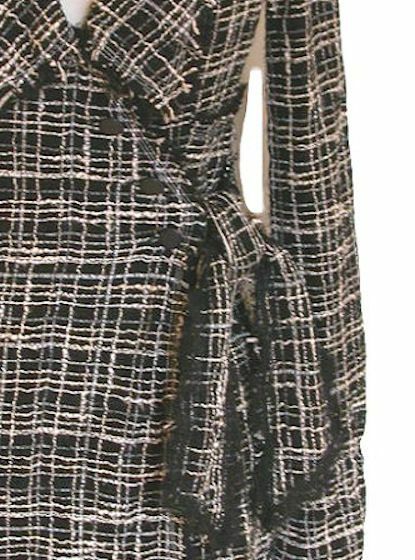 Classicly cut with deep collar, wrap belt at waist, the coat/dress buttons down the front diagonally with silver CC signed buttons. 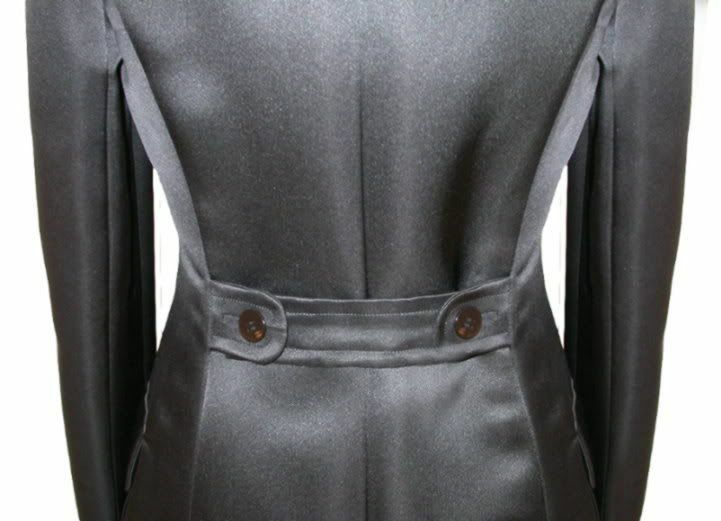 There are two bust and two hip pockets both trimmed in lace. 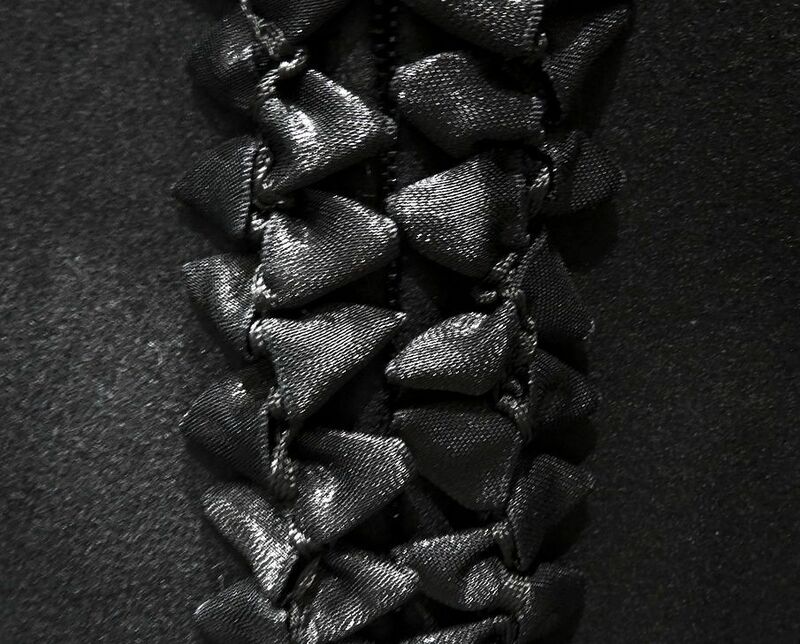 The sleeve cuffs, belt, and hem are also lace trimmed. 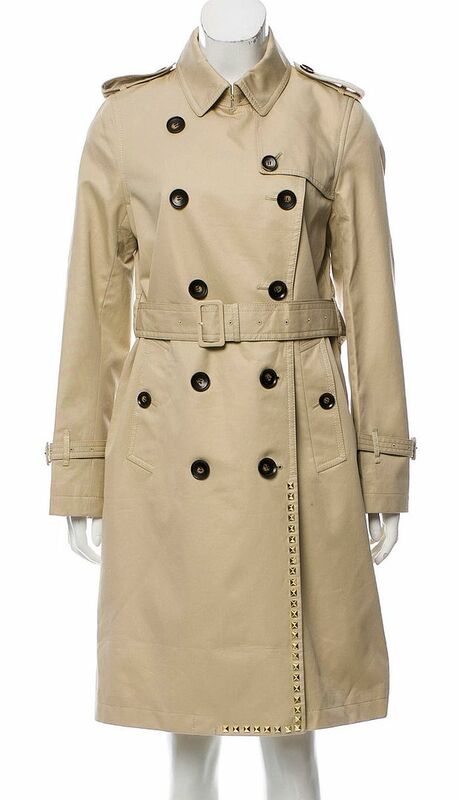 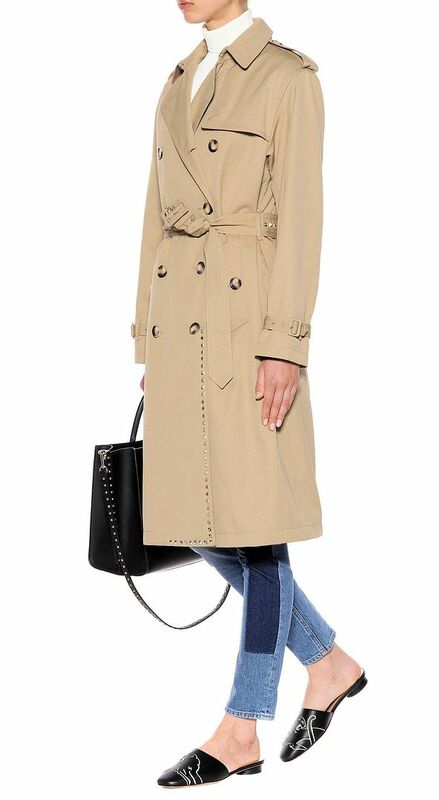 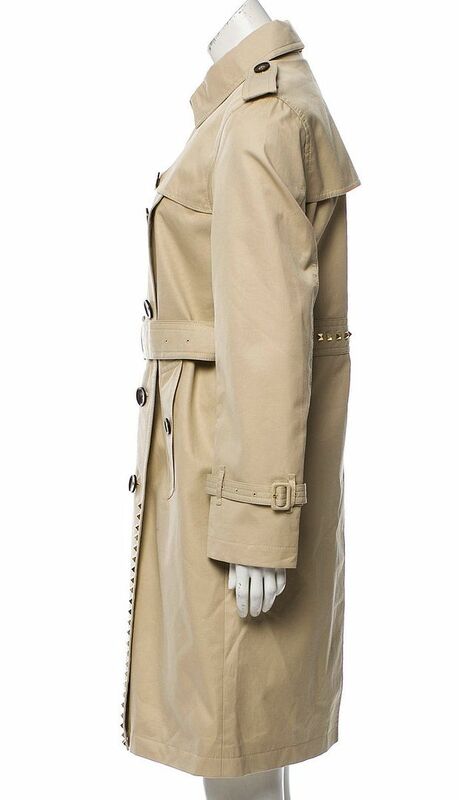 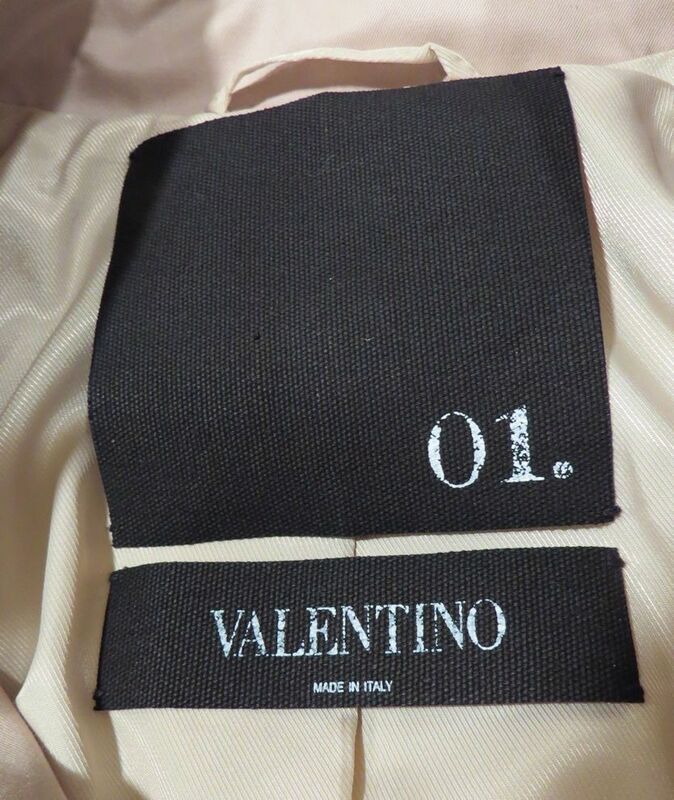 IMPOSSIBLE TO GET, the Valentino rock stud trench coat. 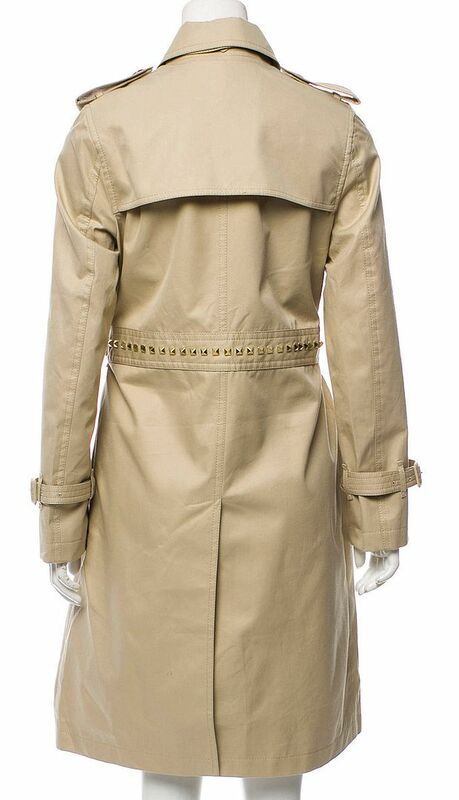 In NEW condition, it is the classic trench studded with the Valentino "rocks" in gold down the front and across the back belt line. 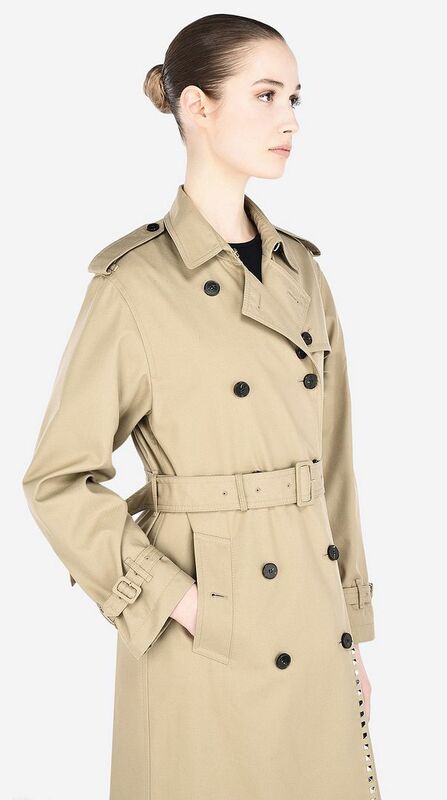 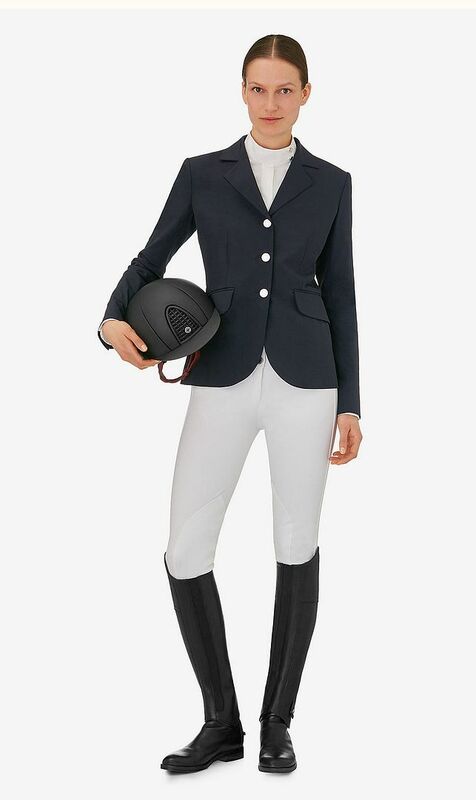 Retailed for $4490 plus tax, it was IMPOSSIBLE TO GET, the go to trench of the season. 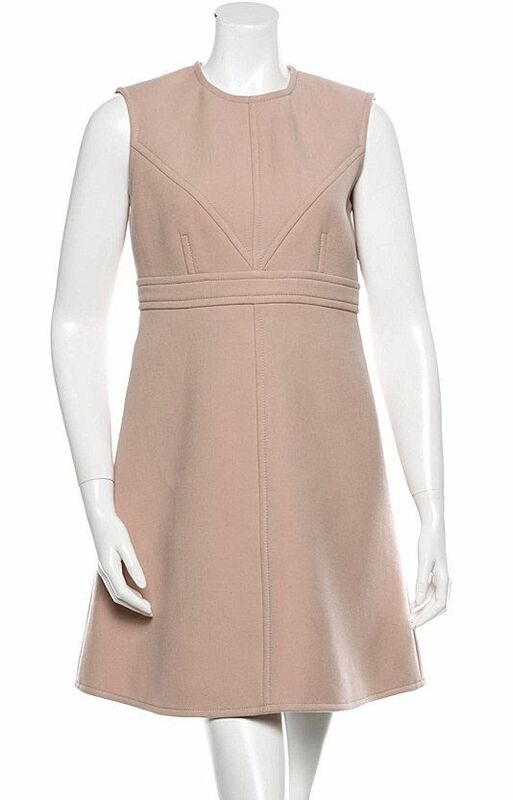 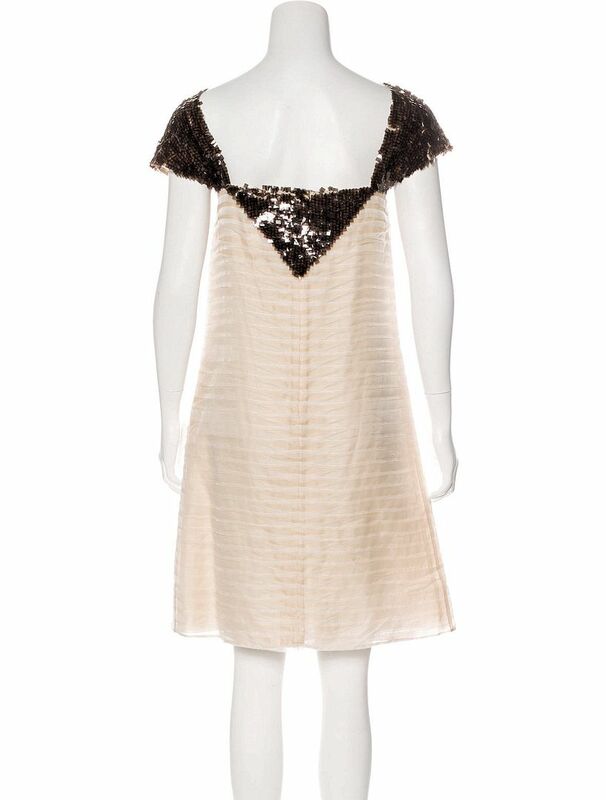 Brand new with tags, retailing for $2400 (with tax) this sleeveless blush wool shift dress was the centerpiece of the 2014 ad campaign. 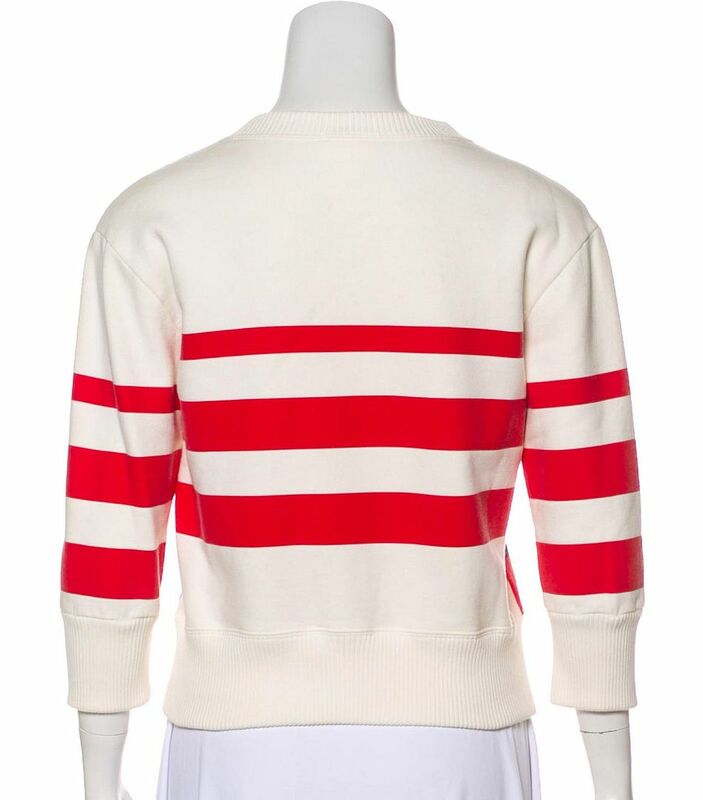 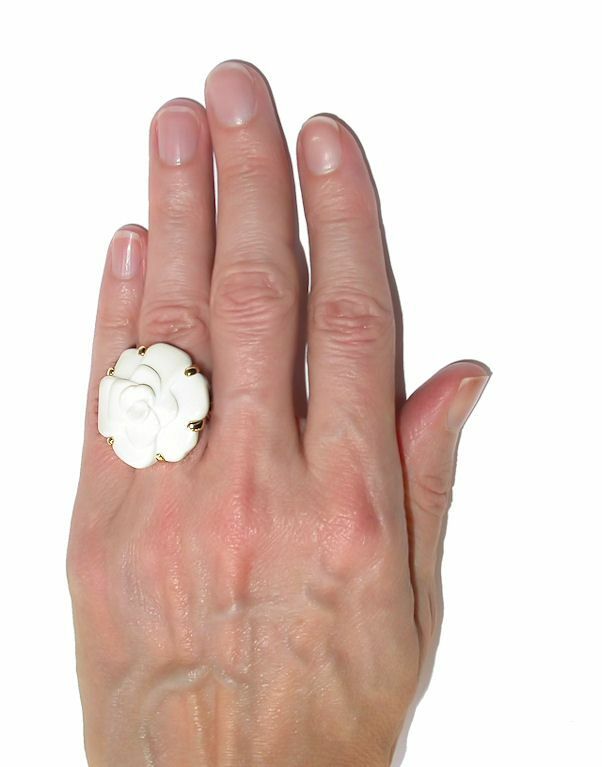 Worn by Michelle Williams, it is SUPER CHIC, incredibly sophisticated and amazingly flattering! 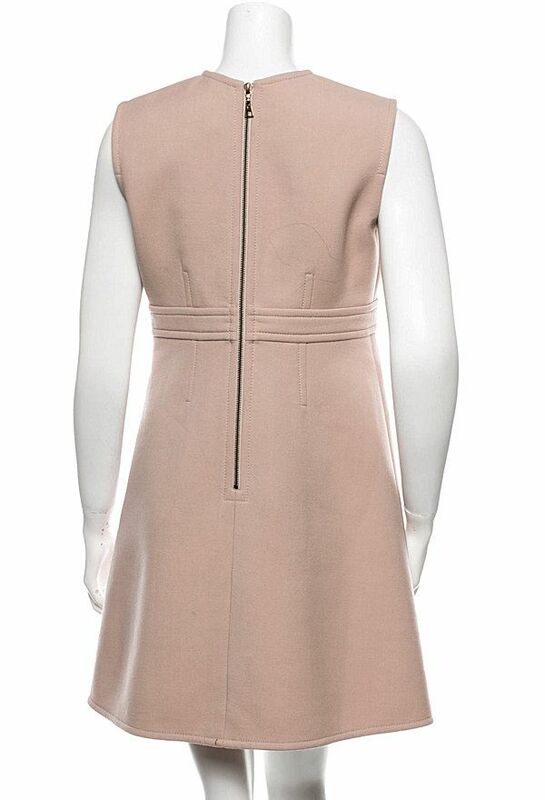 Blush beige 100% wool with geometric paneling, empire waist, tonal stitching and exposed gunmetal LV signed zipper down the back, it is unlined. 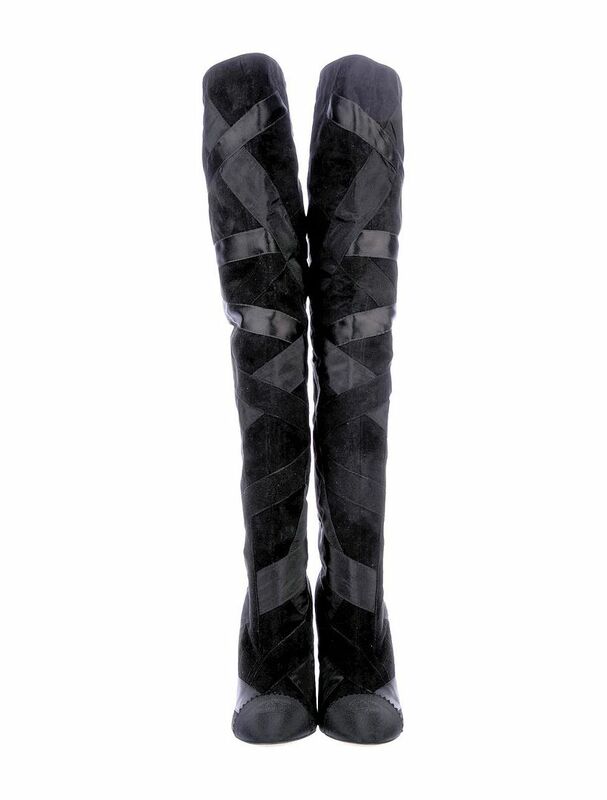 Brand new with tags, these AMAZING Haute couture-esque boots are from Chanel's 2017 pre-fall collection retailing for $2300 with tax. 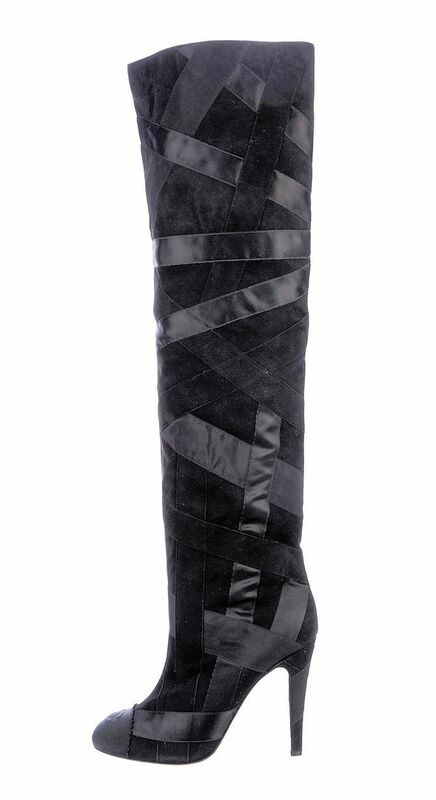 Black suede over the knee boots, they are embellished with silk and grosgrain ribbons woven throughout including the heel. 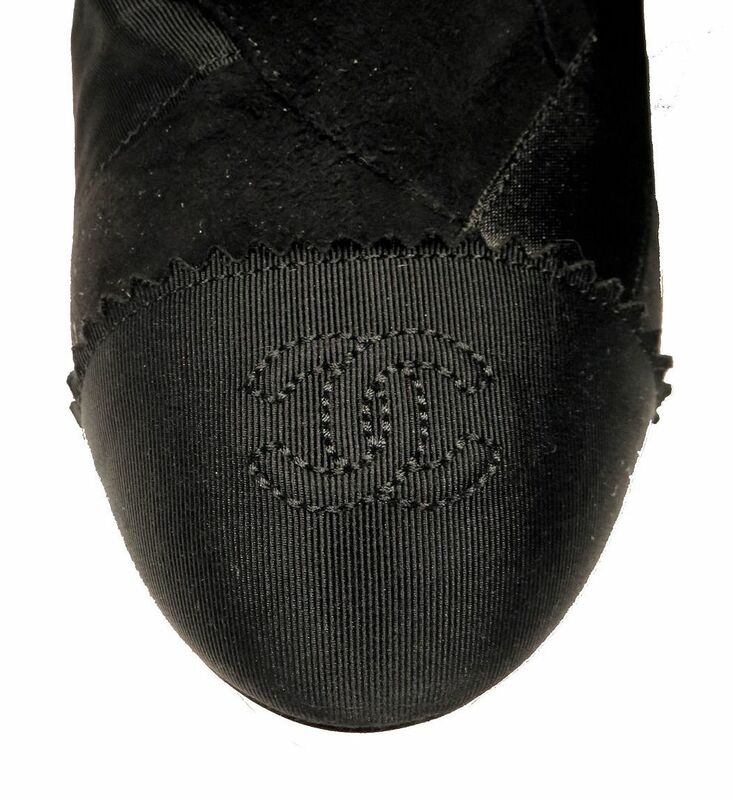 CC stitched into the round toe, they are DIVINE! 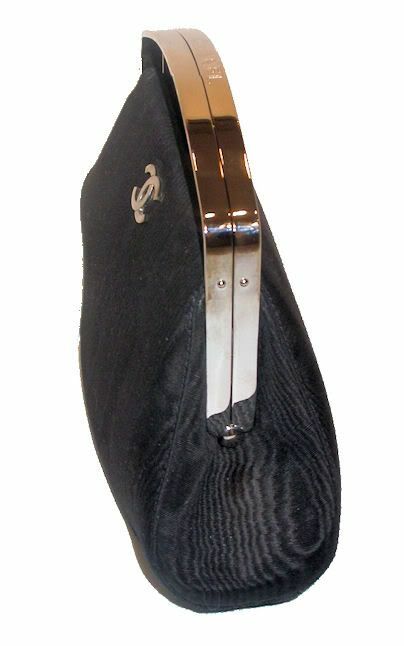 Euro 40.5, they fit true to size, best for a US 9.5 and have a 4.25" heel, 22" shaft, calf circumference 16". 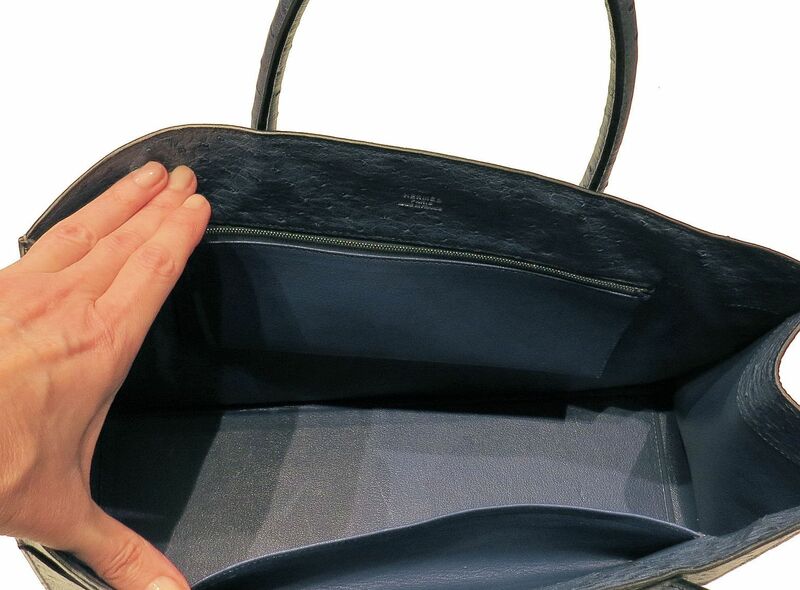 In SUPER MINT condition, this $1550 black silk grosgrain bag has an ingenious framing that keeps its shape and is easy to open and close with almost a magnetic feel to the closure. 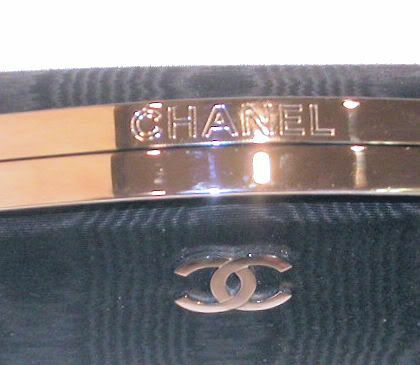 Silver metal framing, the top of the handle is signed Chanel. 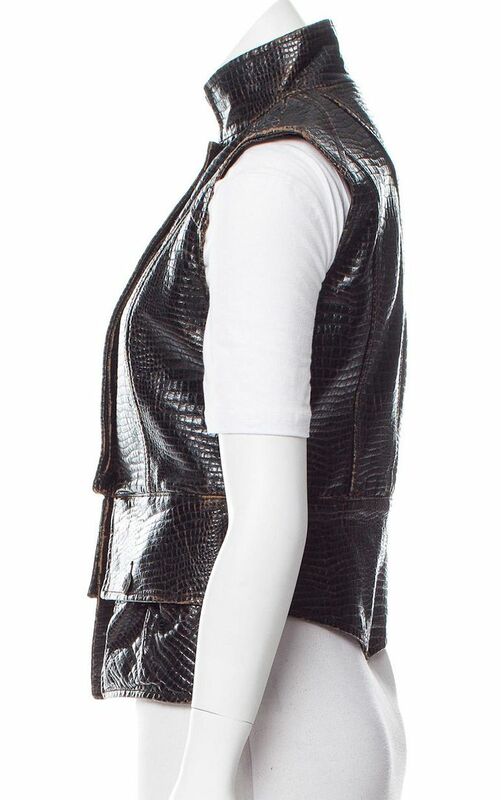 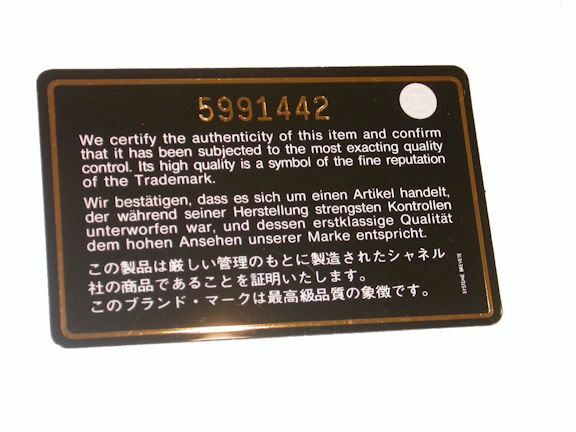 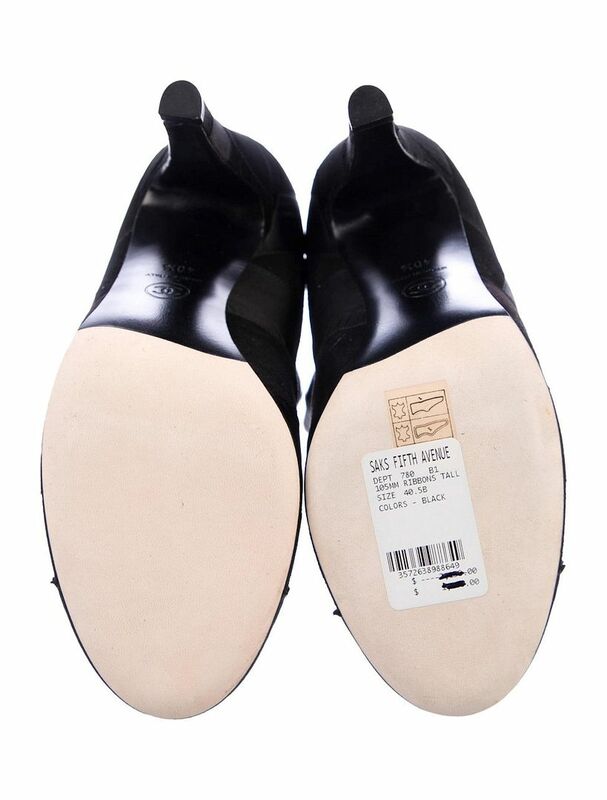 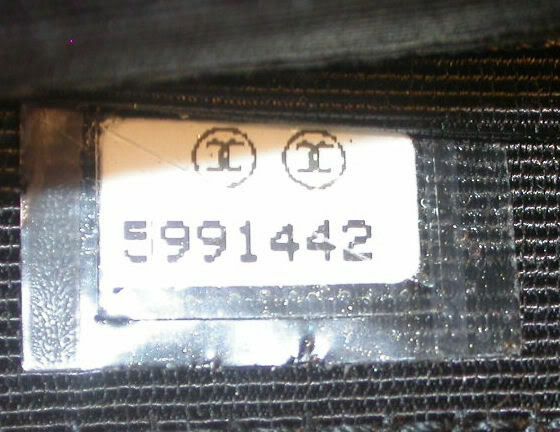 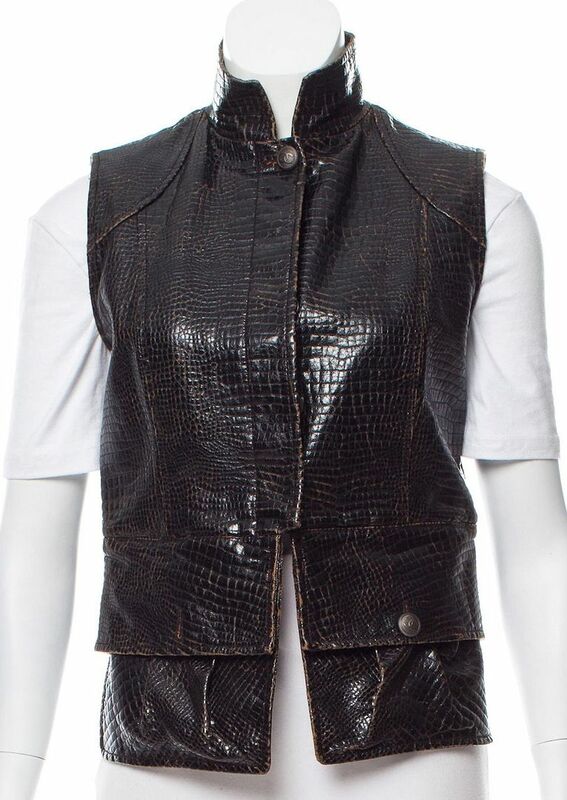 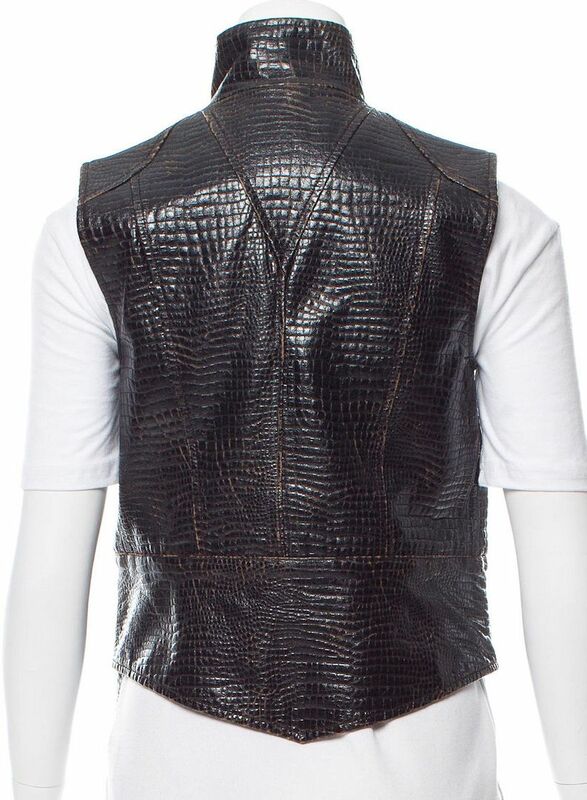 Lined in lambskin, it has the hologram in place and comes with the matching authenticity card. 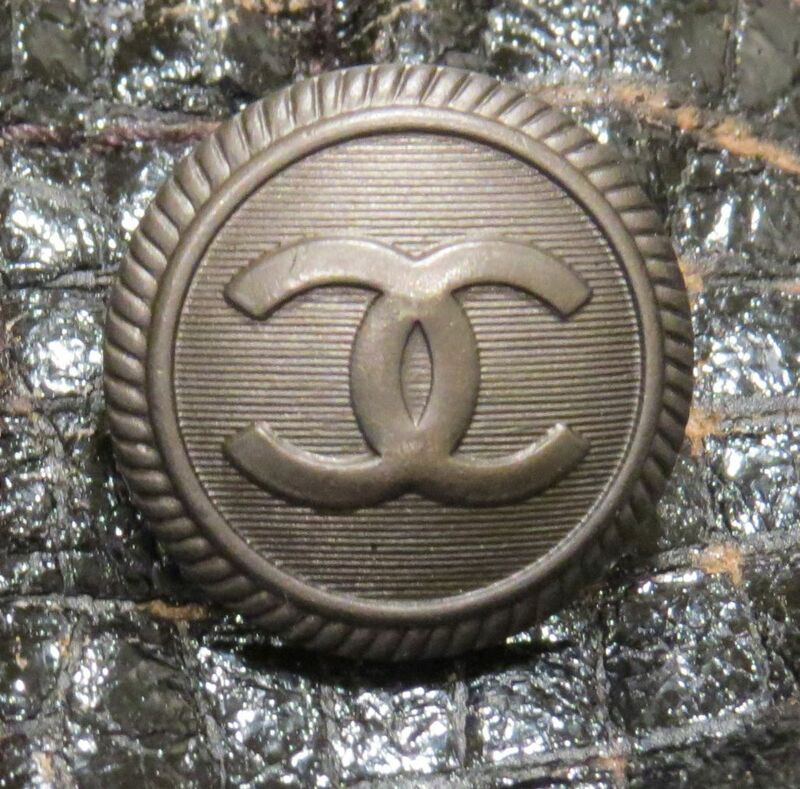 Silver CC Chanel plaque on the front. 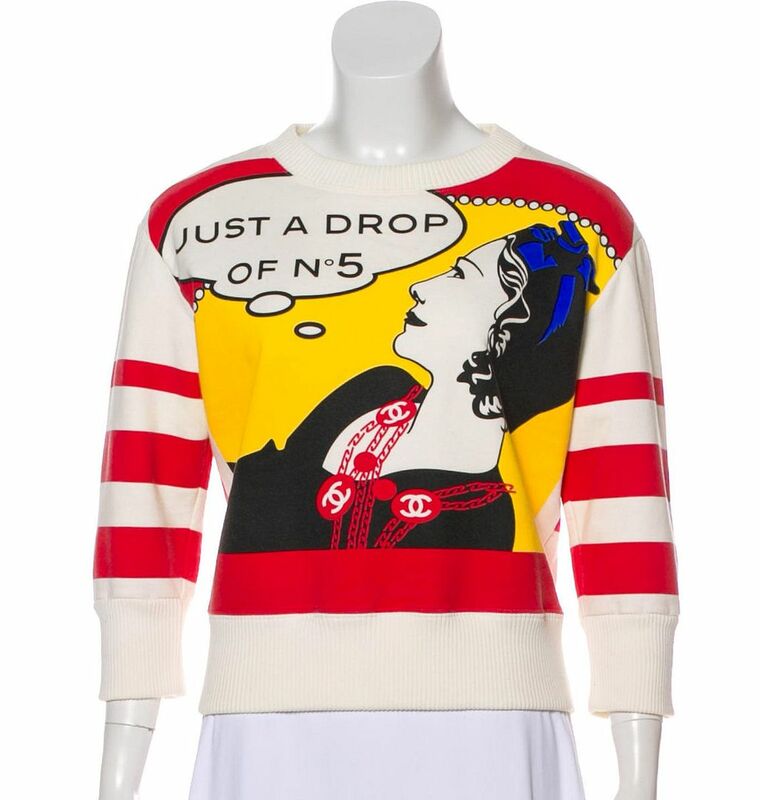 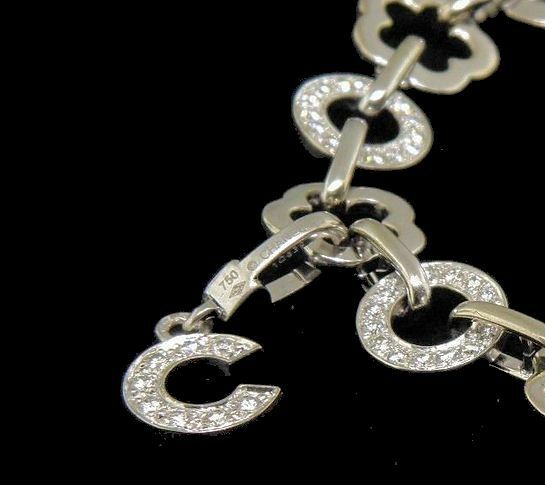 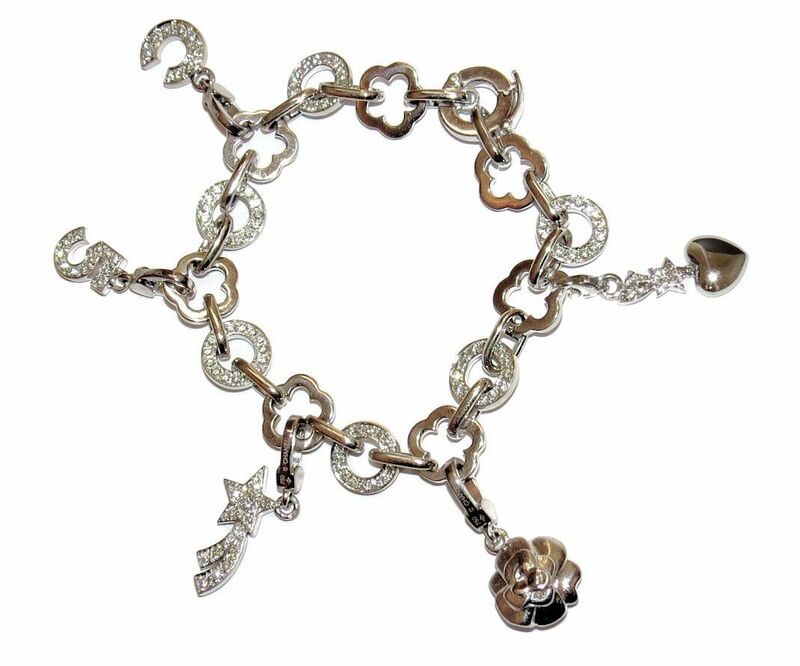 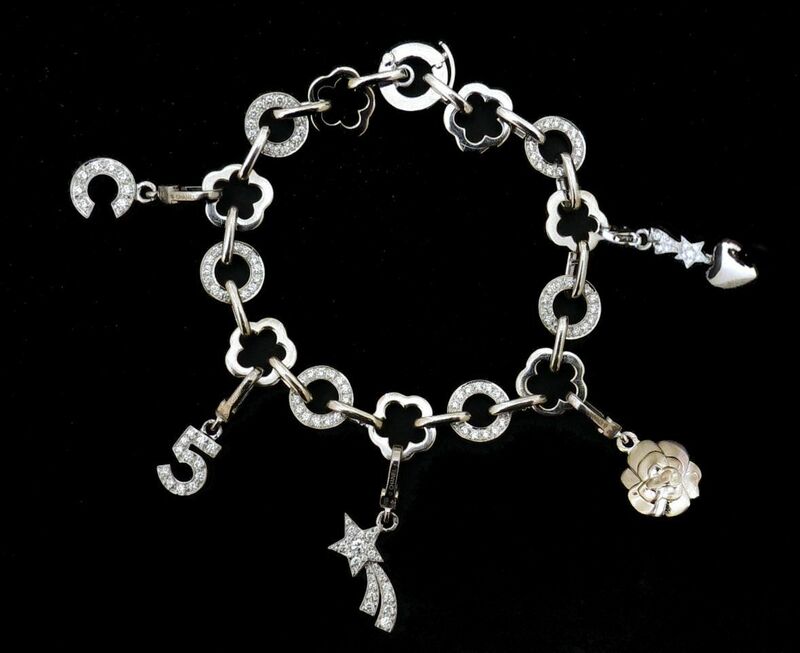 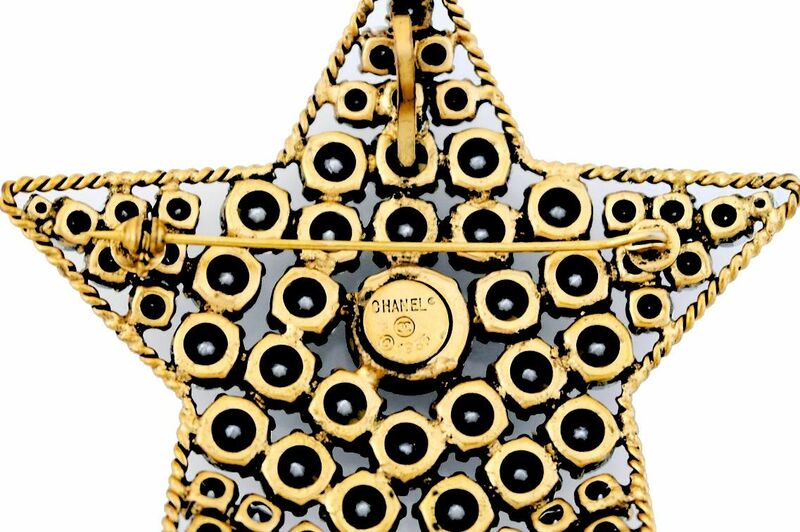 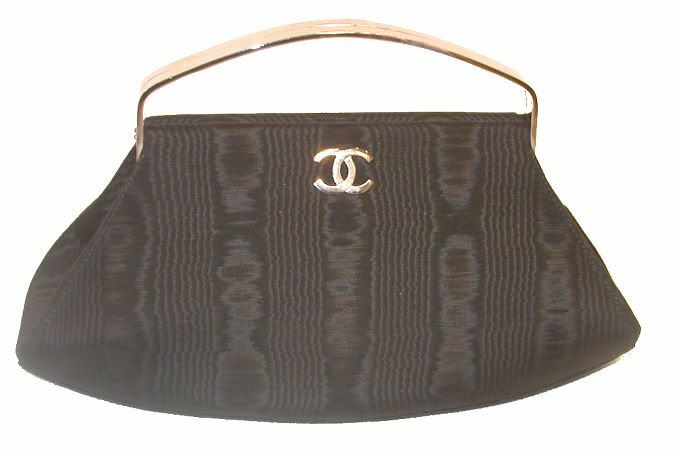 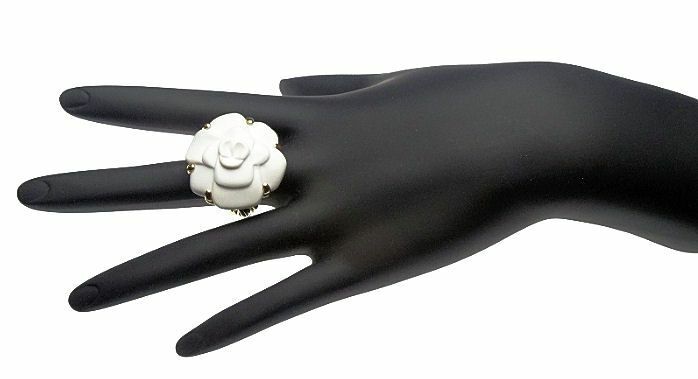 Perfect inside and out, it is a MUST for Chanel collectors! 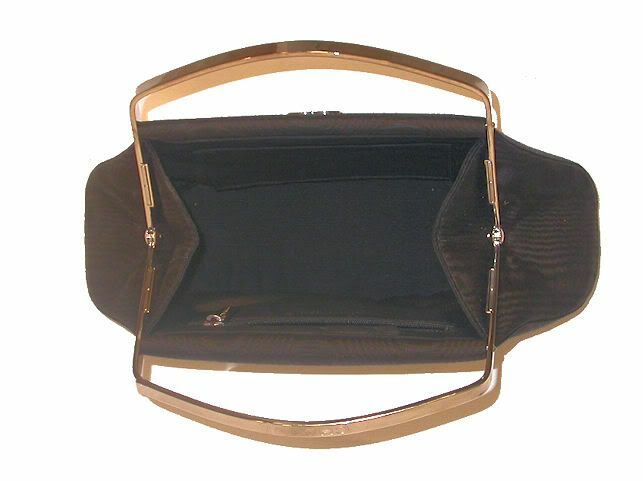 Bag is 11" wide at the bottom, 7" tall including the handle and 3" deep. 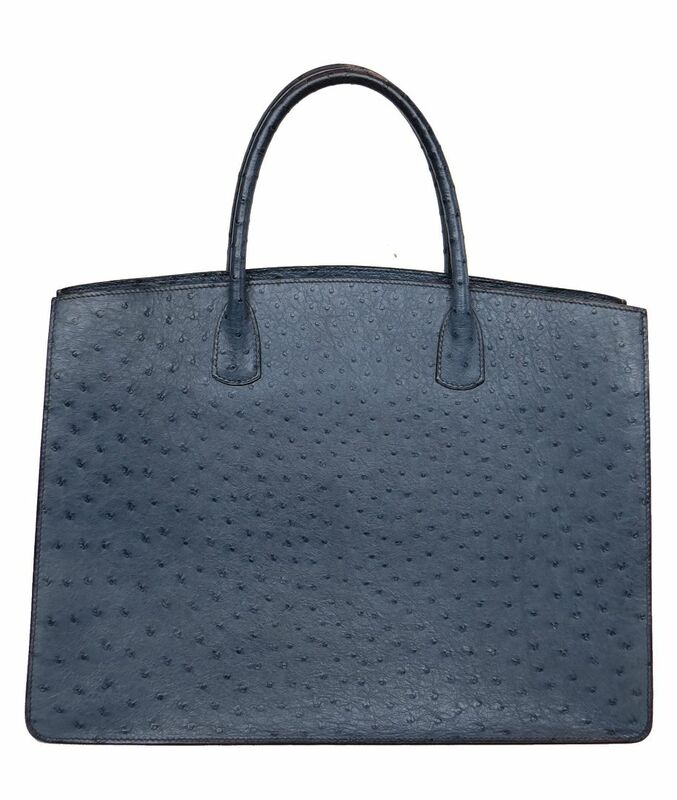 Carries EVERYTHING for evening! 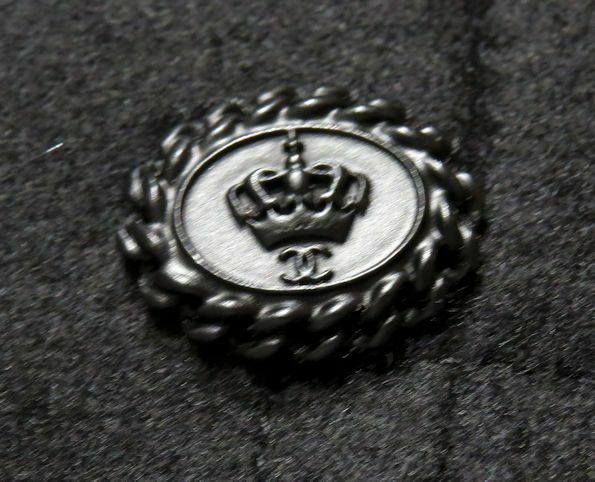 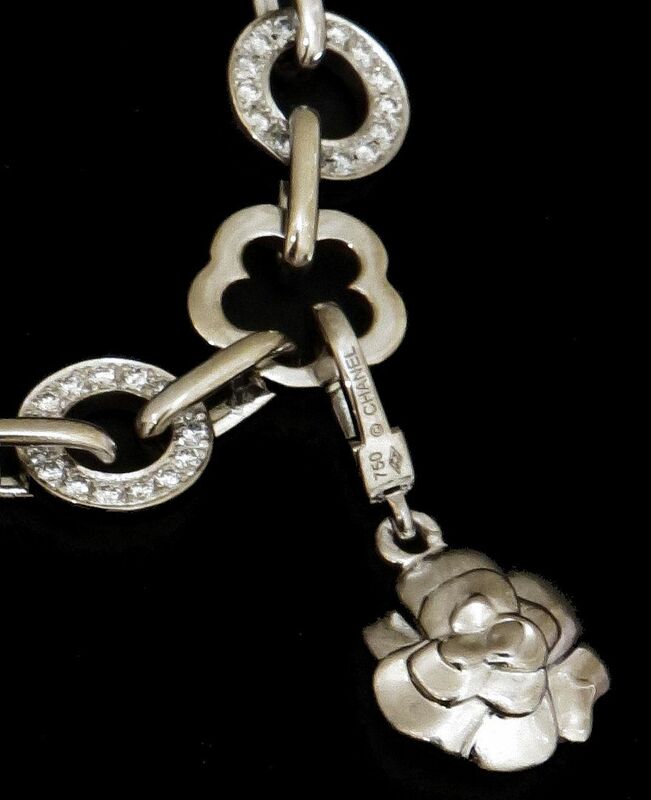 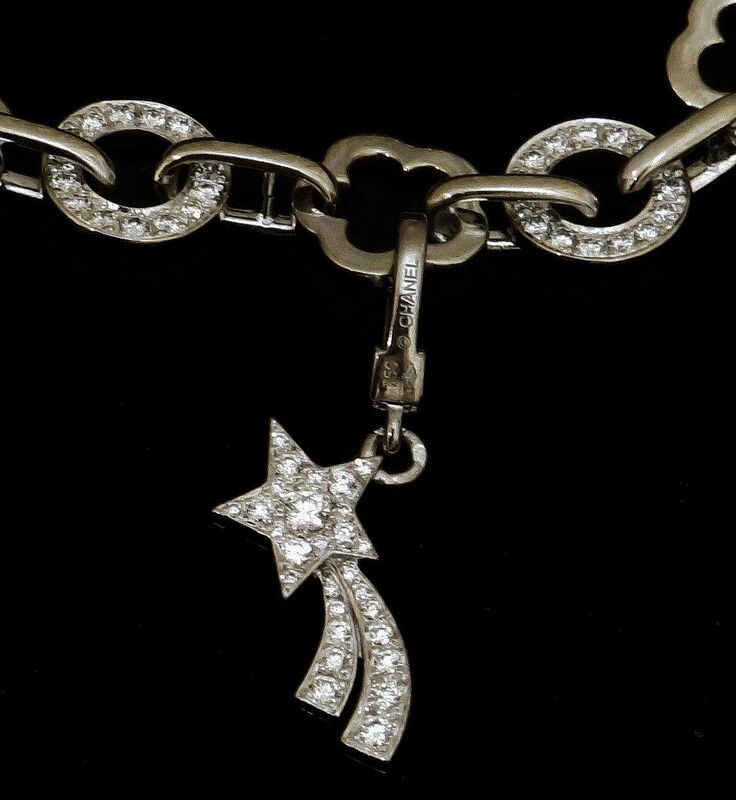 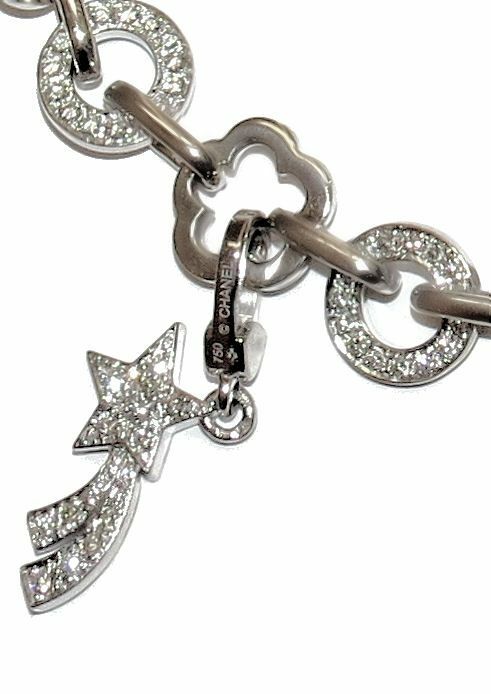 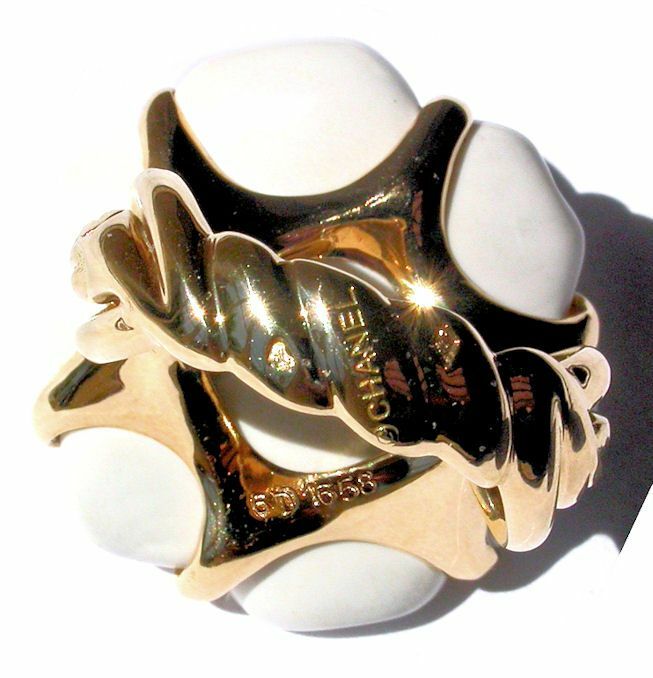 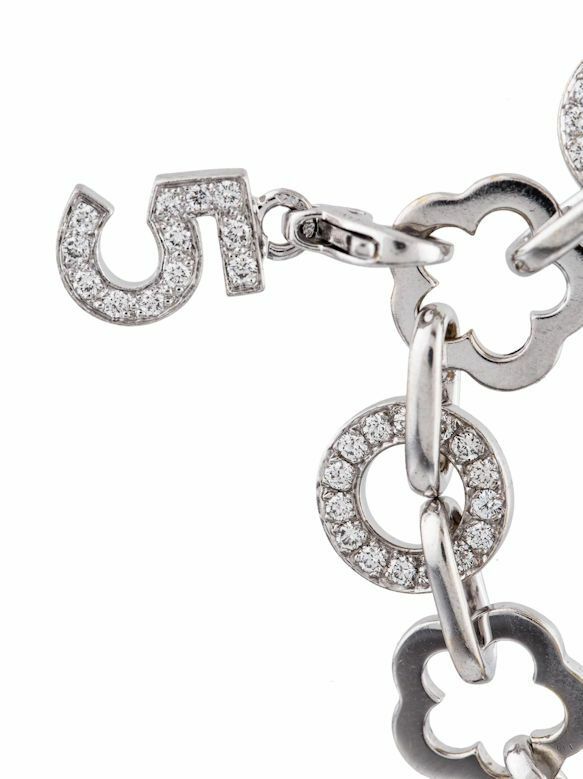 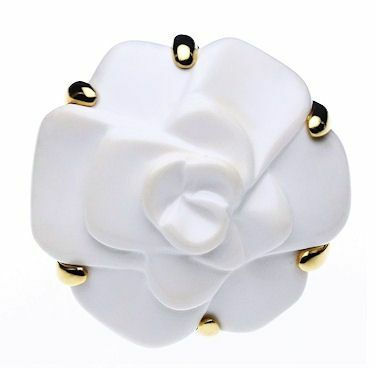 From Karl Lagerfeld's first collection for Chanel, 1983, In MINT CONDITION, this comete brooch/pendant is in the iconic diamond comet (comete) shape that has been one of the two motifs (the other is the camellia) that Chanel has used from Coco Chanel's time throughout the reign of Karl Lagerfeld. 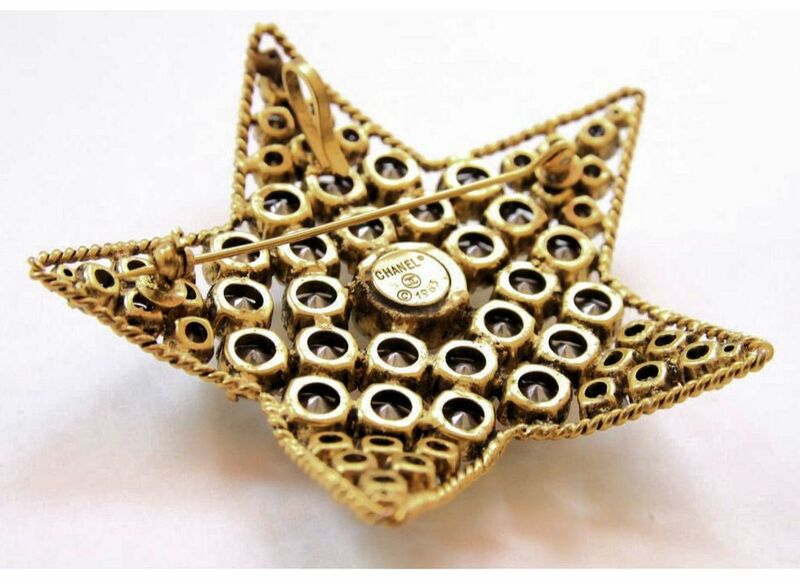 Set in goldtone braided metal, the comete is composed of 61 crystals of varying sizes, the largest one in the center. 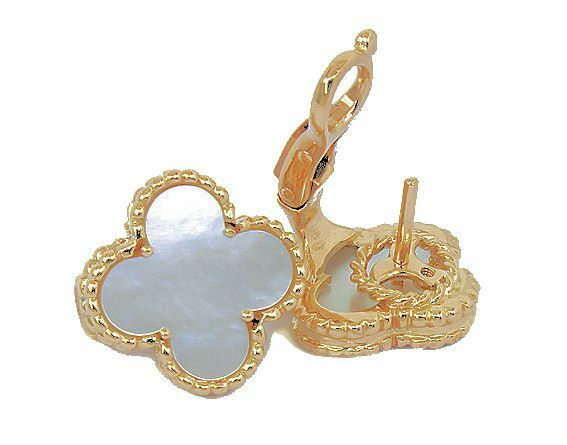 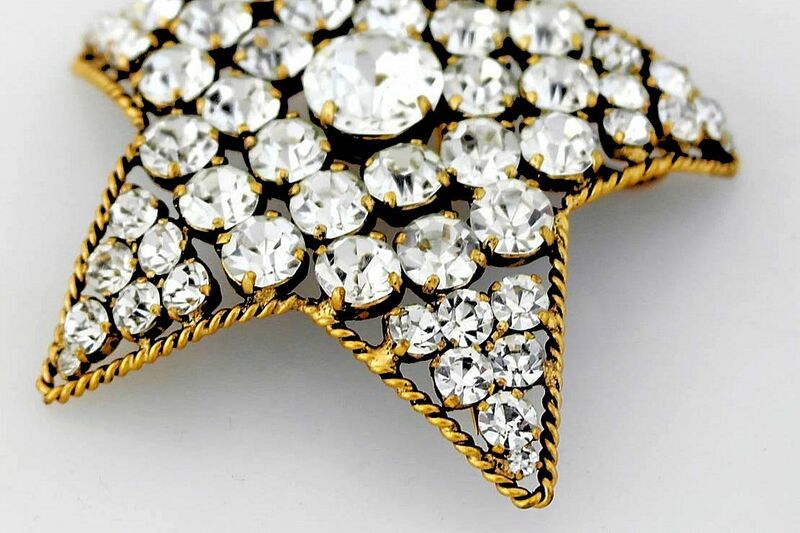 There is the standard brooch pin/clasp and also a hook so that the brooch may be worn on a chain as a necklace or used as a necklace enhancer. 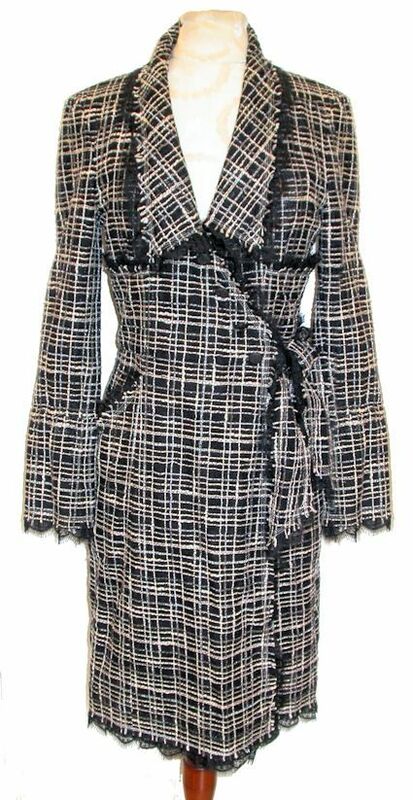 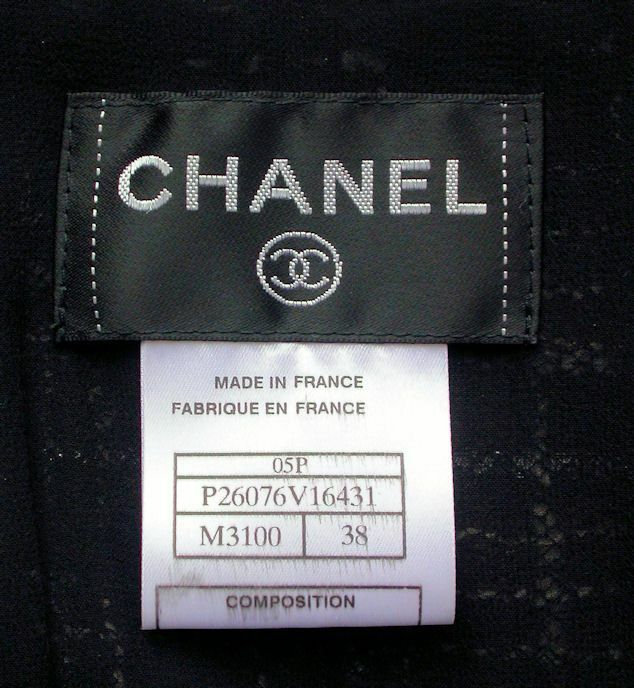 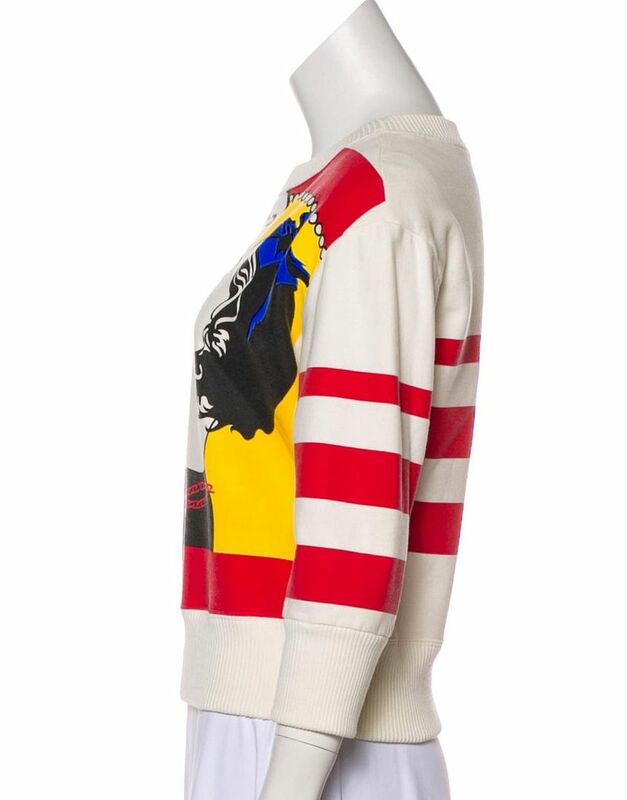 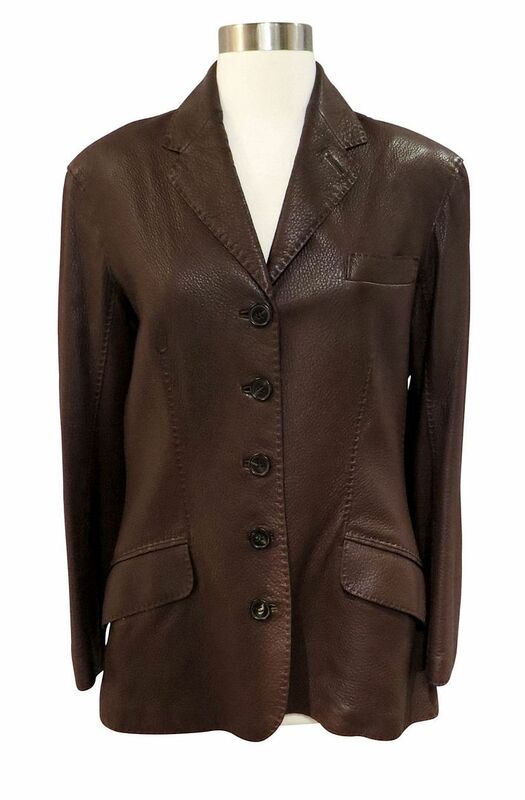 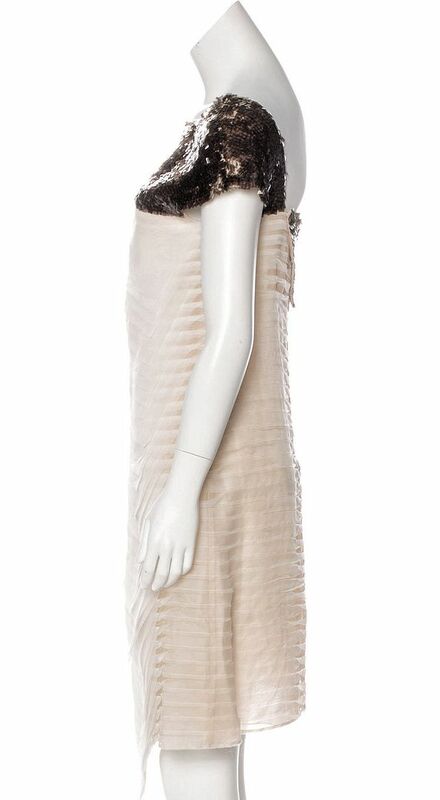 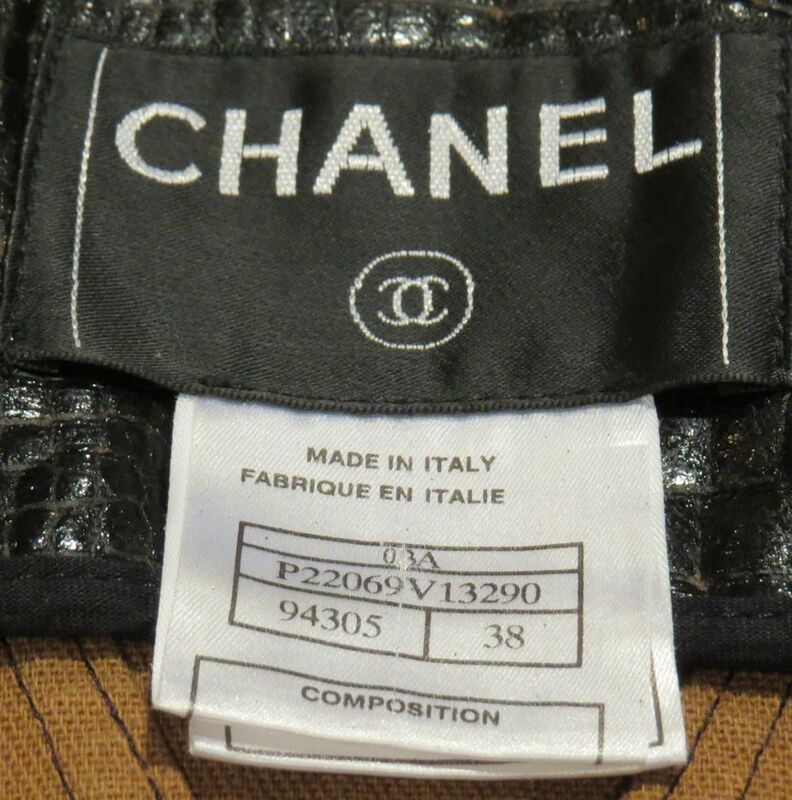 Signed Chanel and dated 1983, this is a RARE OPPORTUNITY to own a piece of Chanel and Karl Lagerfeld history. 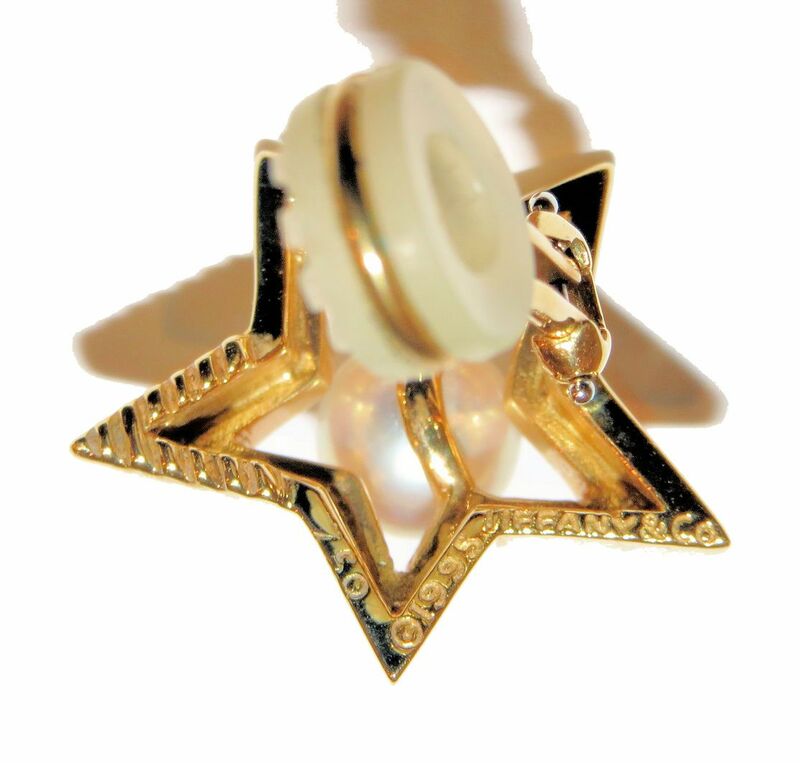 Dimensions: 3 1/4" diameter x 1/2" depth. 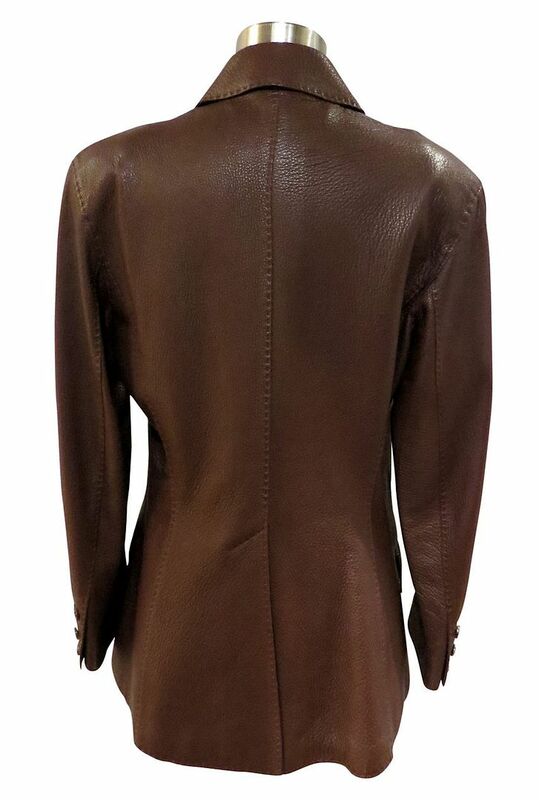 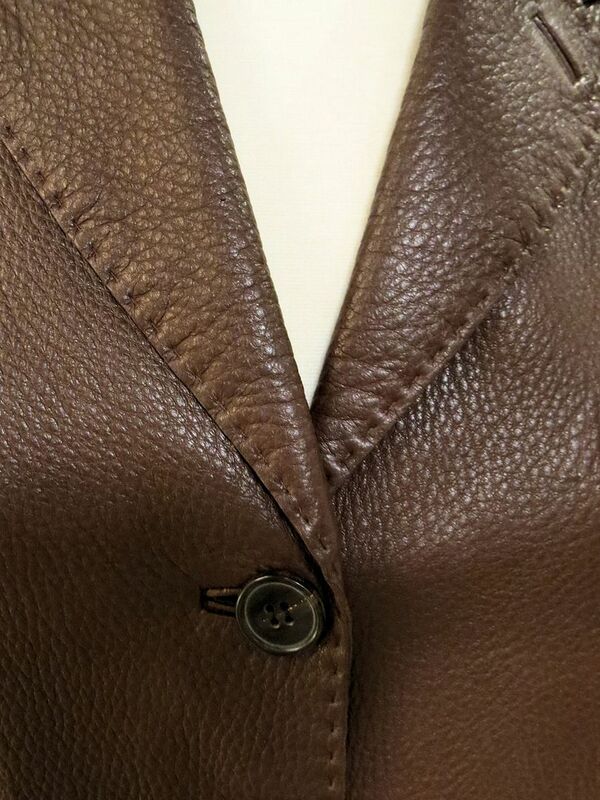 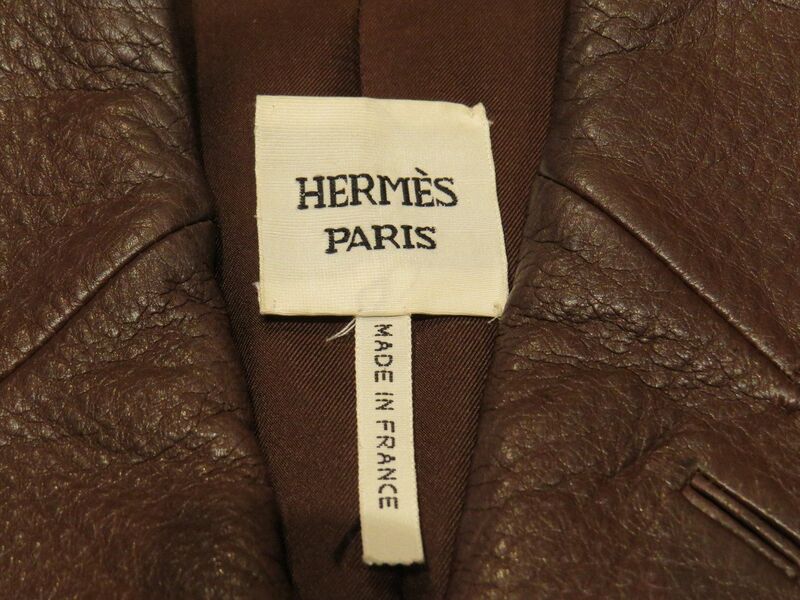 Absolutely gorgeous, amazingly supple dark brown deer skin leather in the classic "jumping" silhouette by Hermès reissued each year. 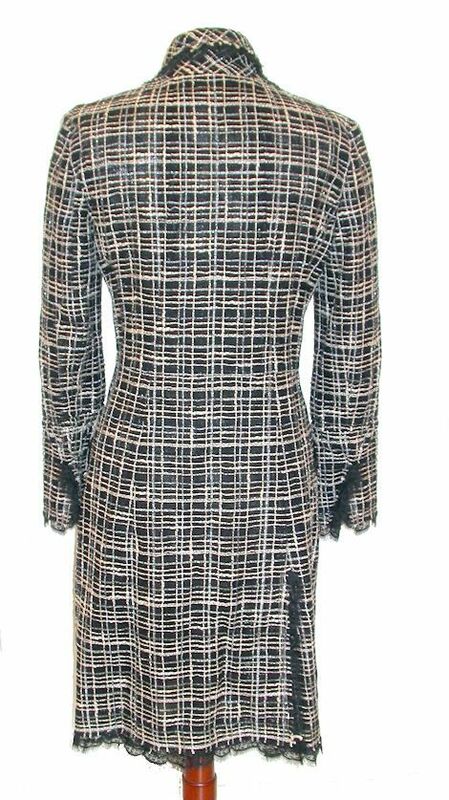 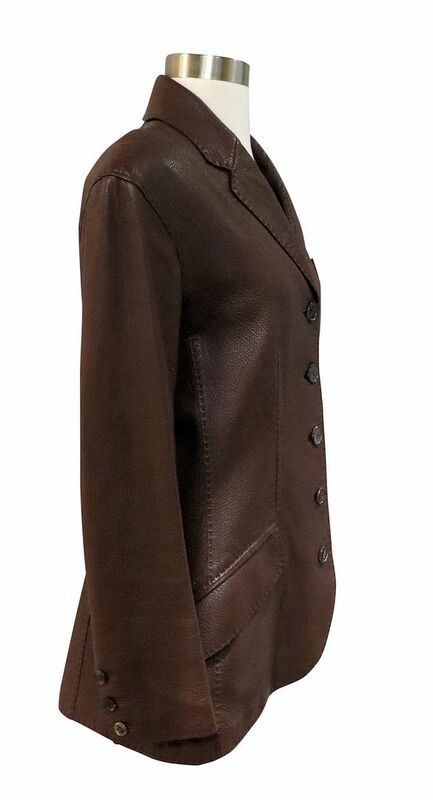 In excellent pre-owned condition with hand stitching, bone buttons and silk lining, this classic cut is one that you'll wear forever! 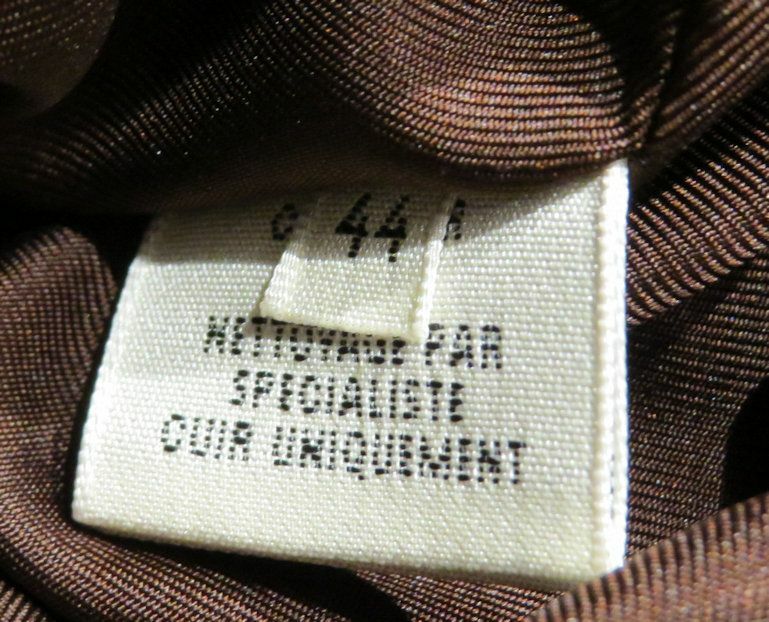 French 44, it works for a French 40-4 with 17" shoulders, 41" bust, 36" waist, 28" long, 22.5" sleeve length. 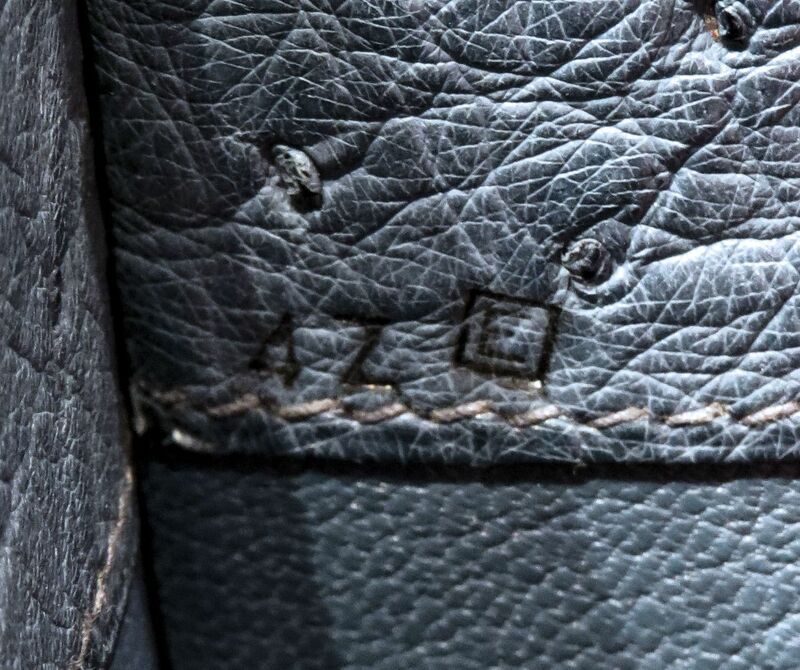 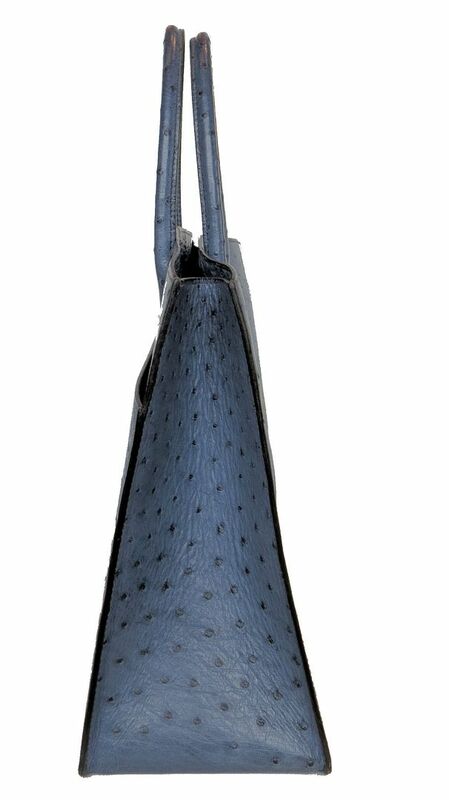 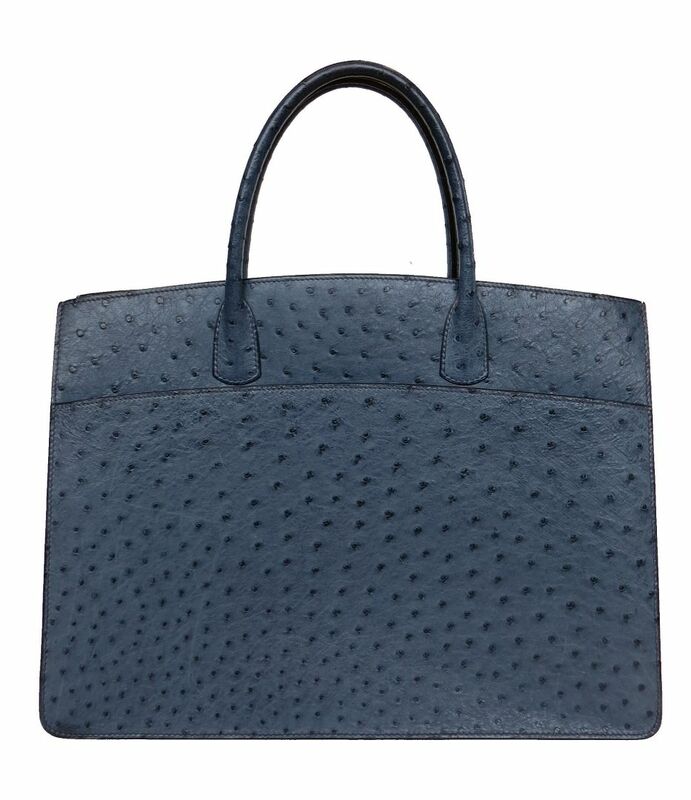 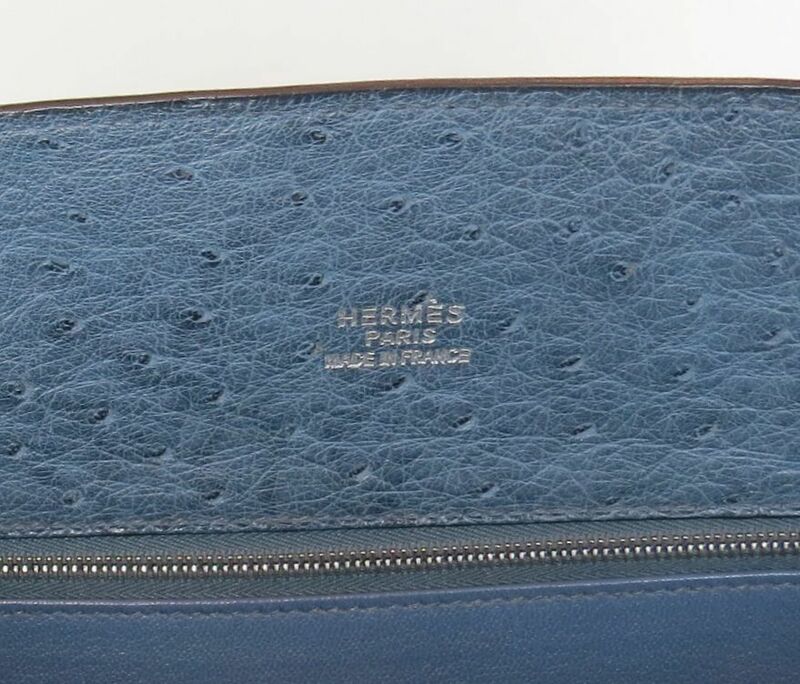 Authentic Hermès SUPER RARE Ostrich White Bus bag/tote in Bleu de Prusse with tone on tone stitching, silver Palladium zipper pull and signature, dual rolled top handles, contrast stitching, exterior pocket, tonal leather lining, dual pockets at interior walls; one with zip closure and open top. 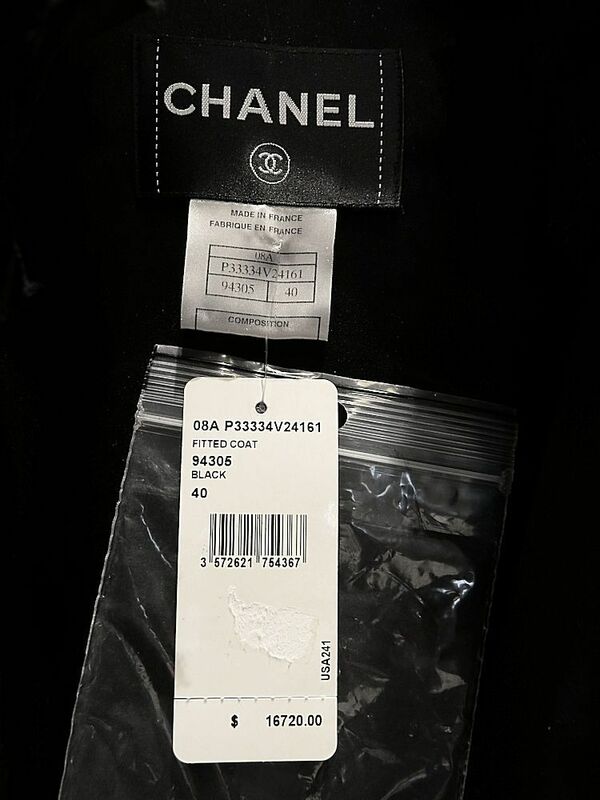 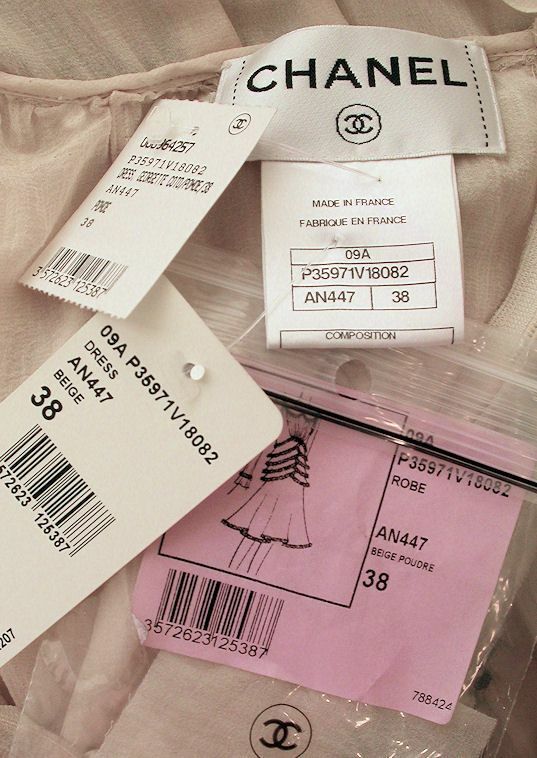 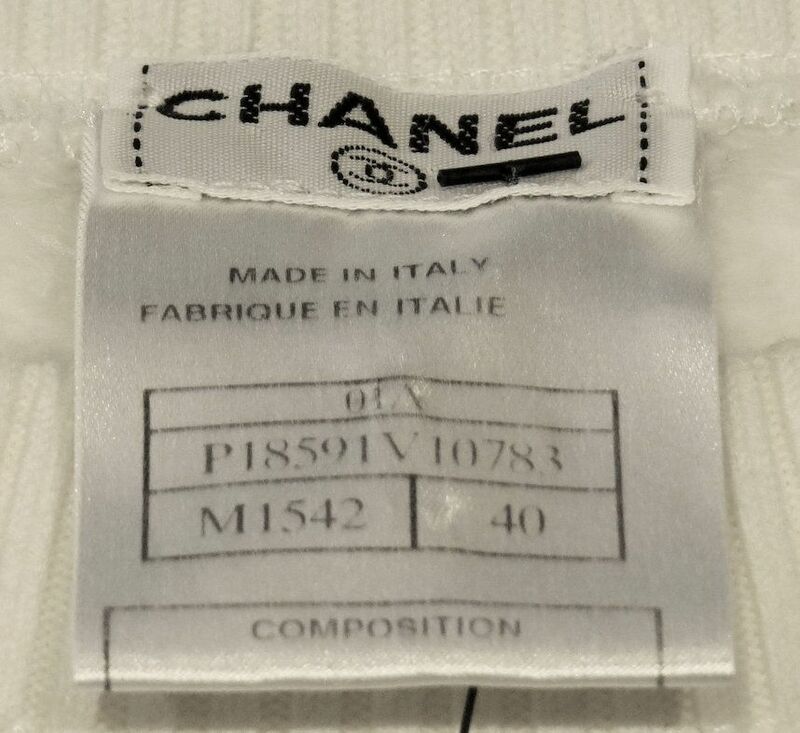 Blind stamped E.
Handle Drop: 4.5"Height: 11.5"Width: 15.5"Depth: 5.5"
Brand new without tags from the Chanel 2012P spring/summer runway collection, Look 71 retailing for $14,655, $15000 with tax, this ivory silk organza Mille-Feuille (named for light airy layers of pastry) pleated dress with mini sequin bodice is haute couture-esque AMAZING! 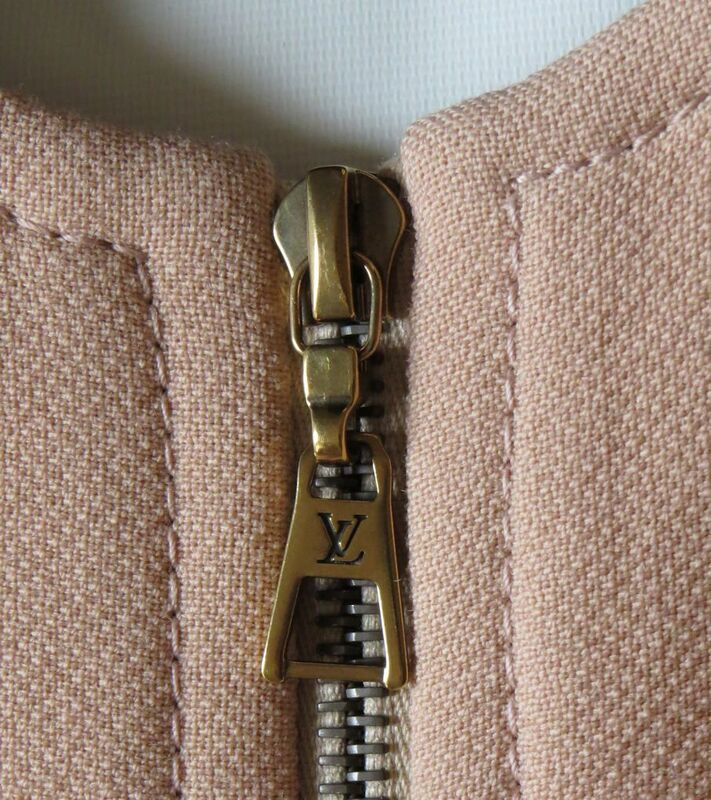 Concealed clear snaps at the back for easy in/out. 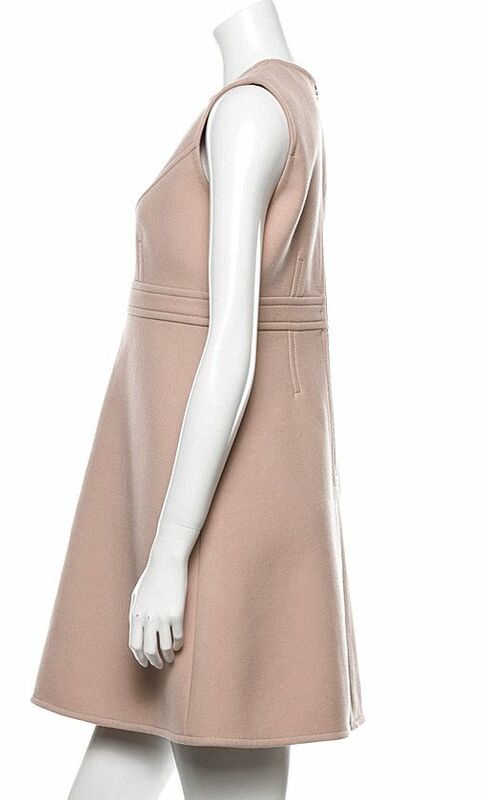 Never worn with tags, this special order $11,300 (with tax)SUPER CHIC and SOPHISTICATED extremely feminine pale blush beige (flesh color with salmon pink undertones) silk Georgette dress trimmed in rich black Mink cascading from waist to hips in layers, each layer trimmed in Mink, buttoning down the back with CC signed pearl buttons. 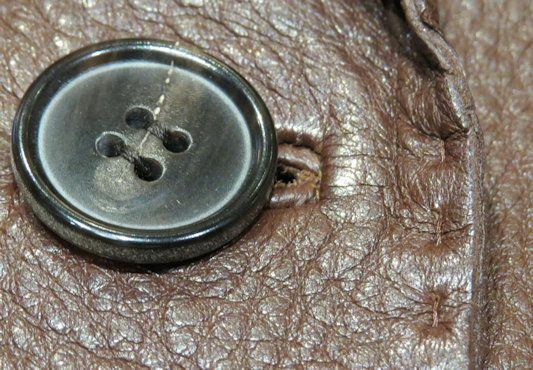 The same buttons adorn the back of each sleeve. 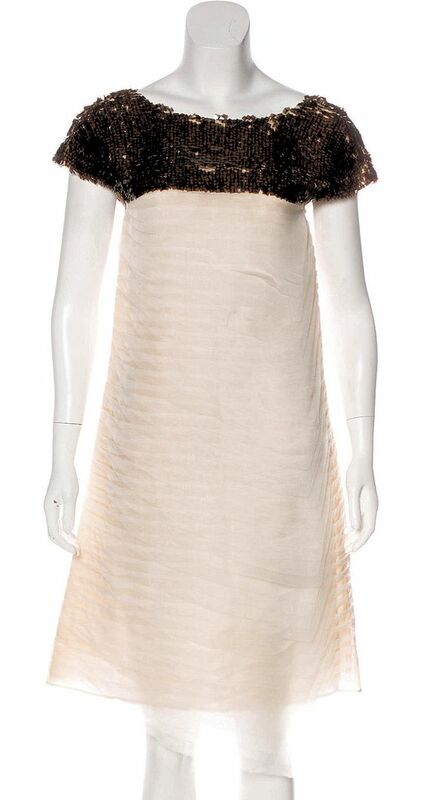 Fully silk lined, this is a MASTERPIECE by Karl Lagerfeld. 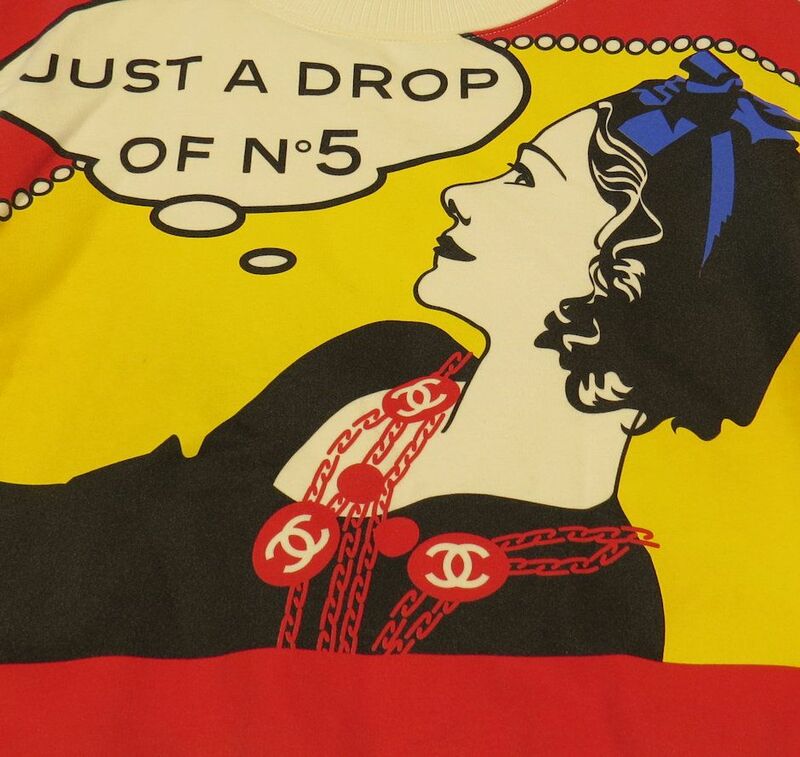 Brand new with tags, it was a limited production piece available by special order only and impossible to get! 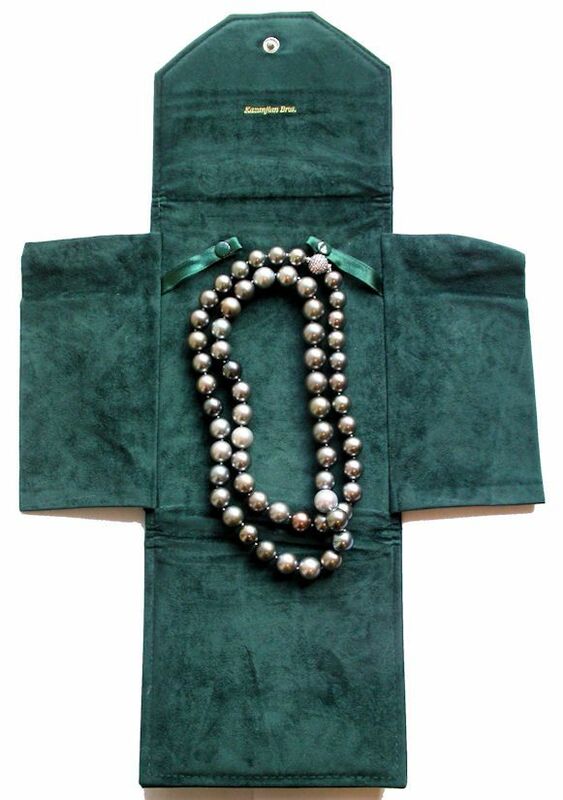 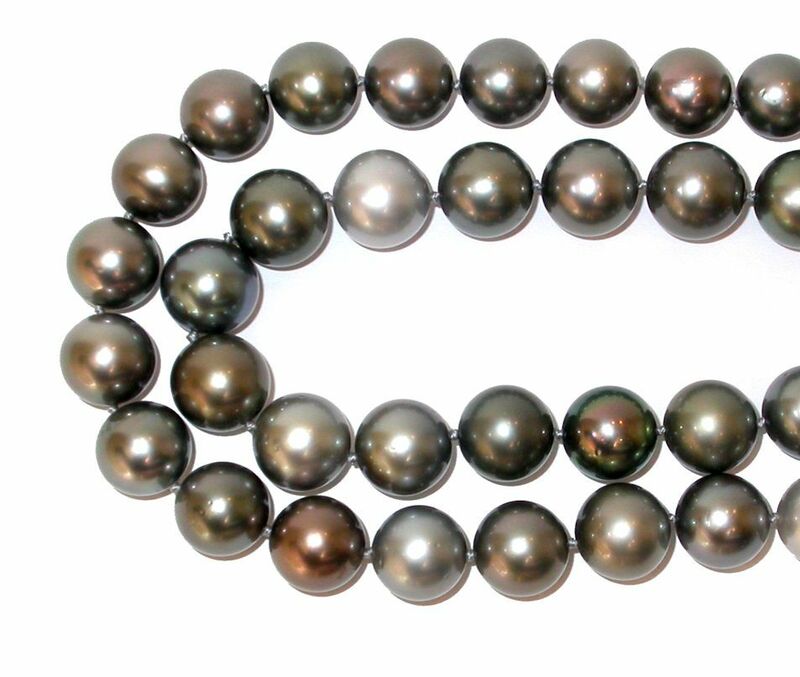 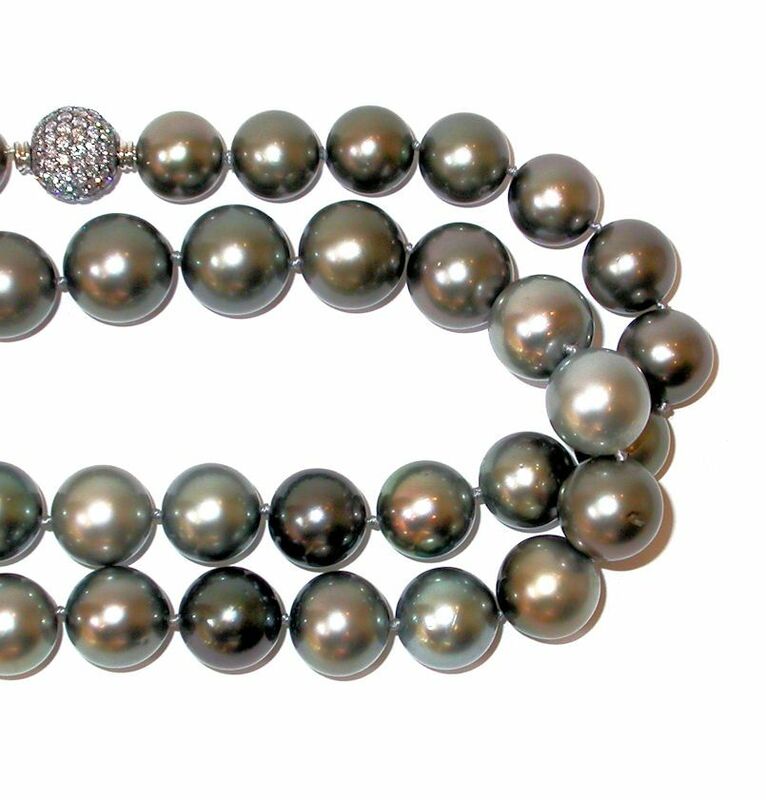 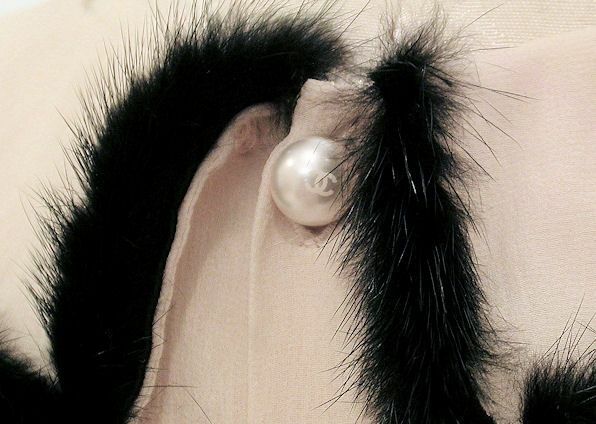 Young, sophisticated, chic, very rare Tahitian natural unenhanced pearls in multi shades platinum to dark grey to black with peacock overtones and fine luster graduating in size from 12mm to 14.5mm with an 18K white gold diamond ball clasp with approximately 2.8 carats of diamonds. 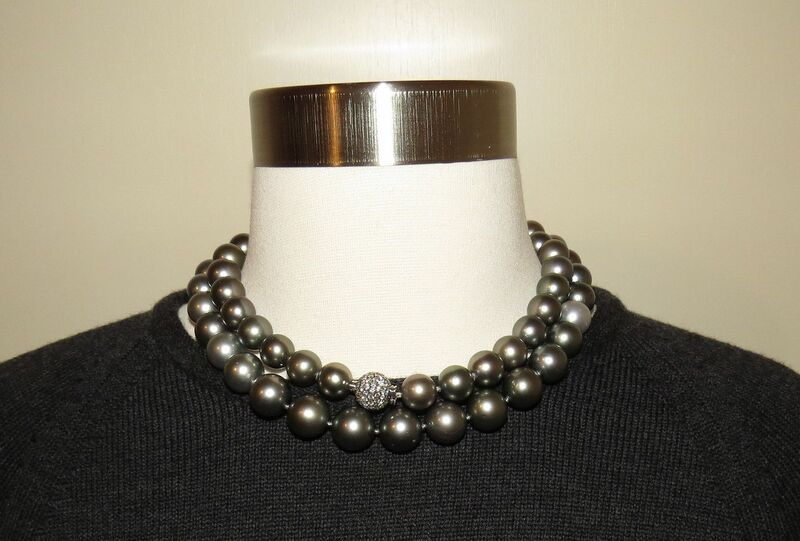 Can be worn opera length or doubled at the neck. 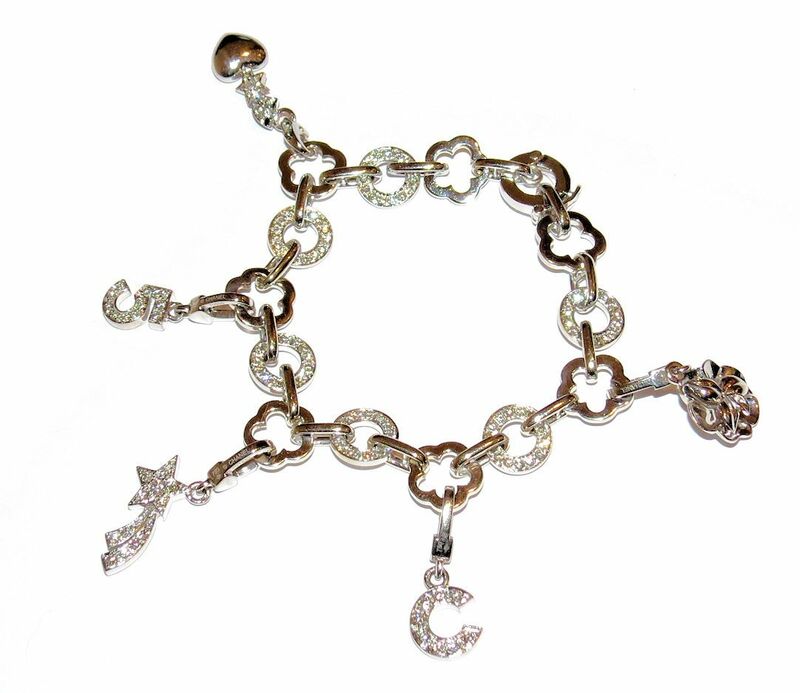 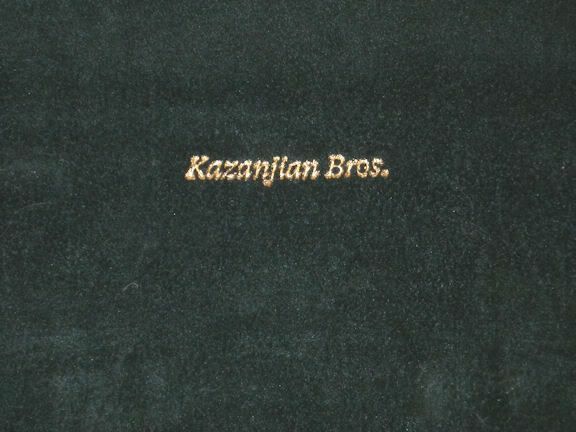 Comes in the presentation case with original letters of appraisal. 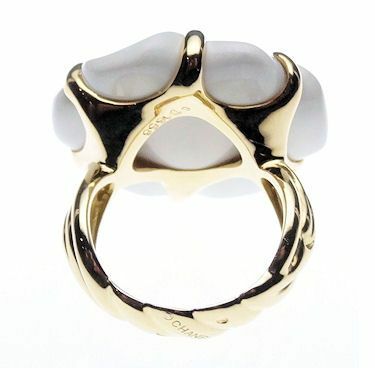 In excellent pre-owned condition, this $6000 (with tax) LARGE white agate stone is cut into the famous Camélia shape and, then, set in 18K yellow gold for a bold yet feminine statement piece. 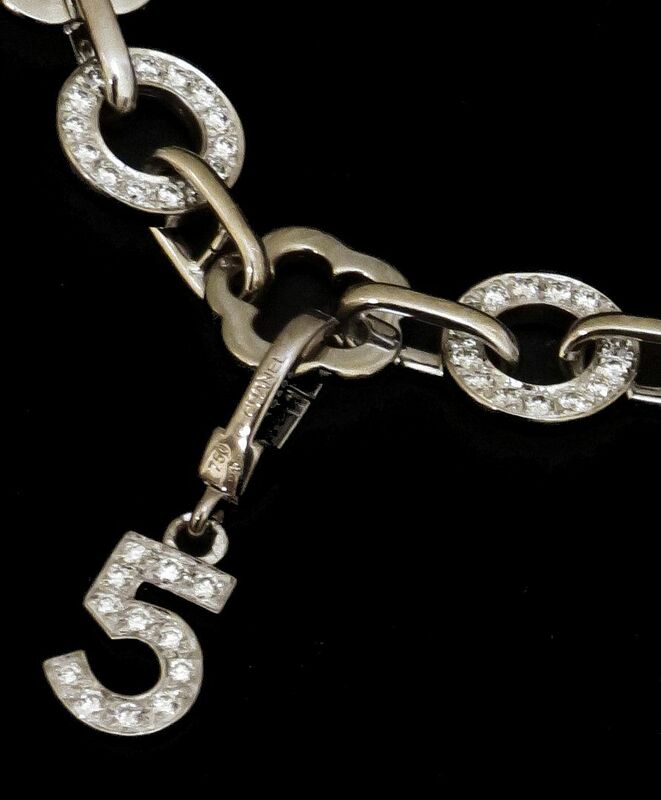 Signed, hallmarked and numbered, it is the large size, a whopping 52.18 carats, measuring 27mm in diameter. 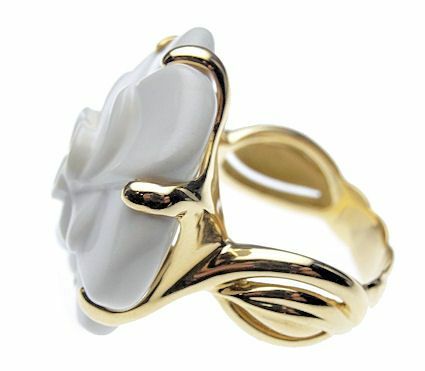 The color is a milky white. 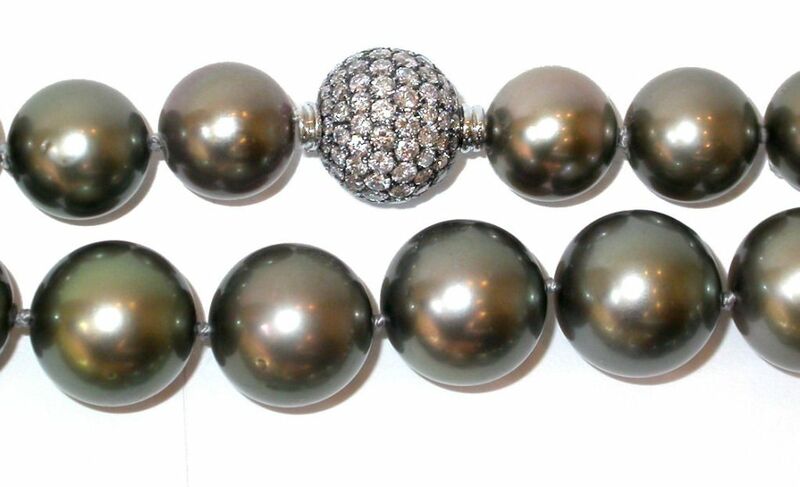 A fabulous statement piece! 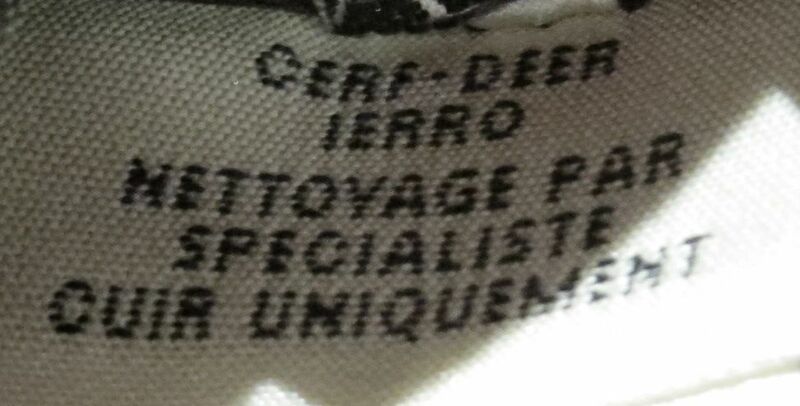 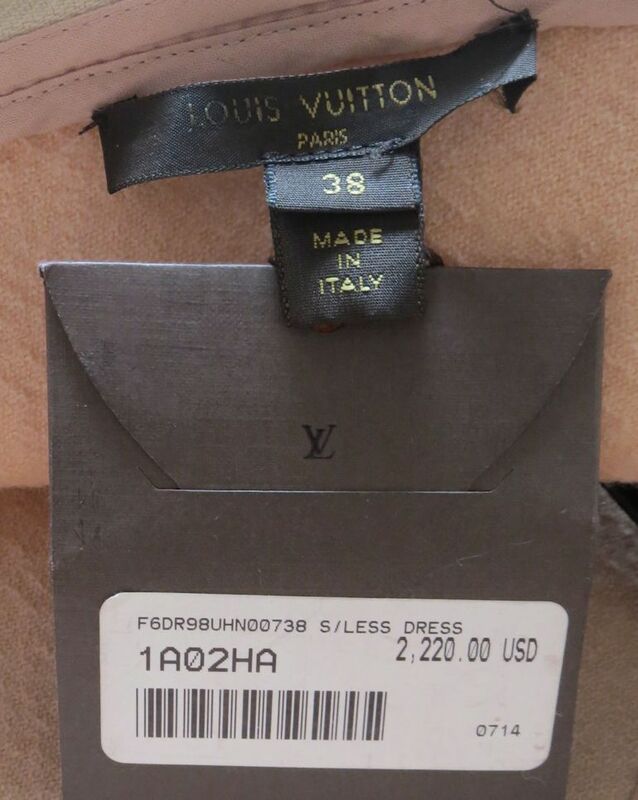 Size US 7.5, French 56, Japanese 15. 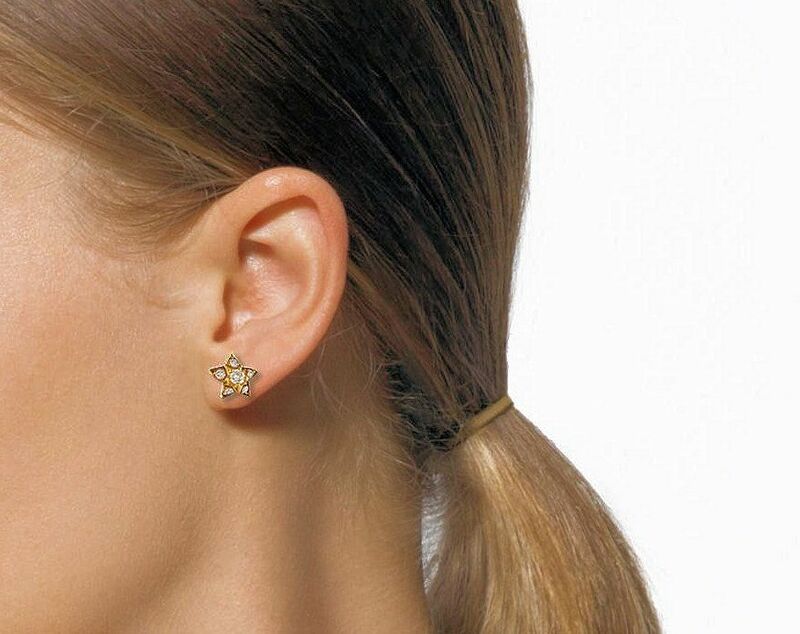 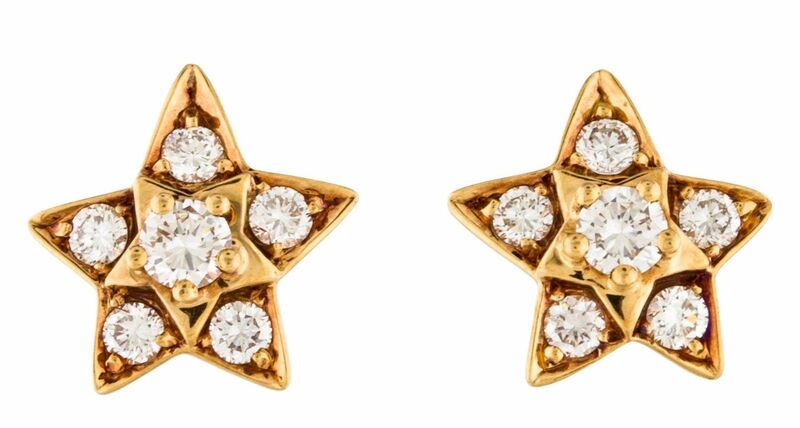 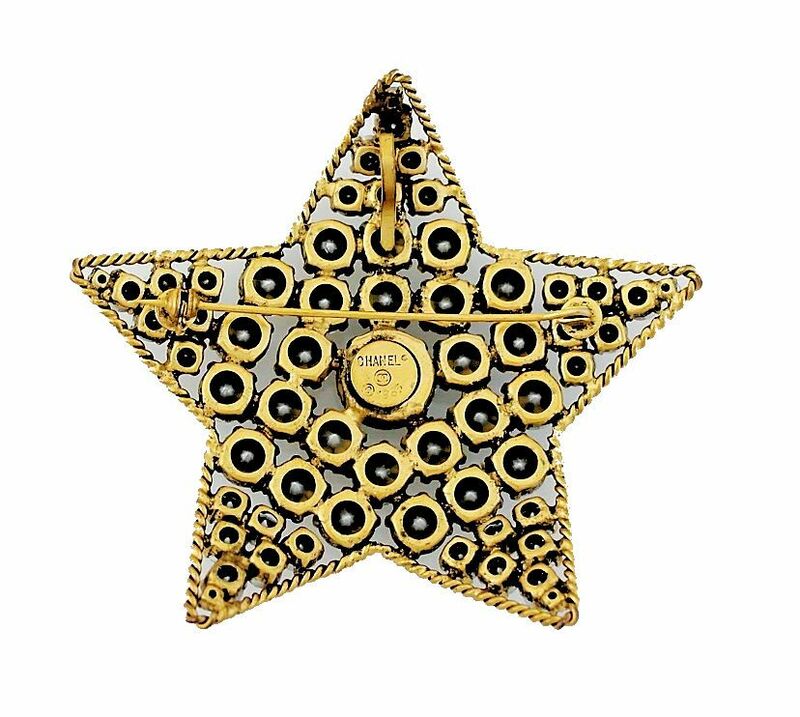 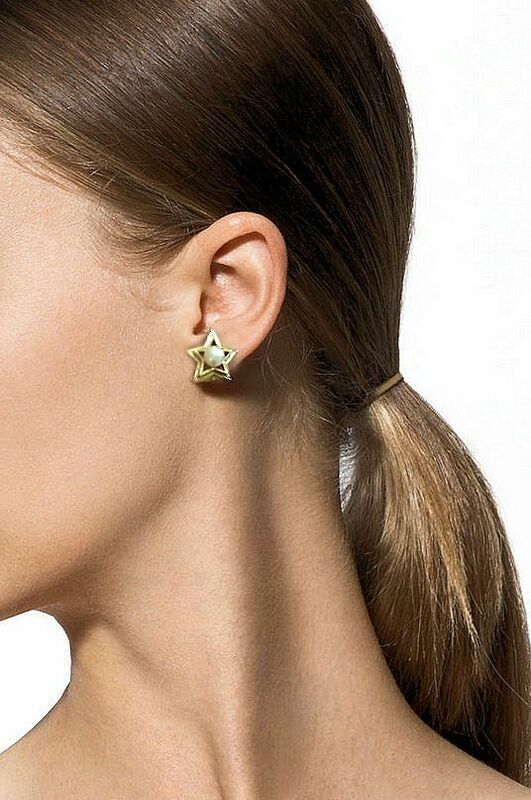 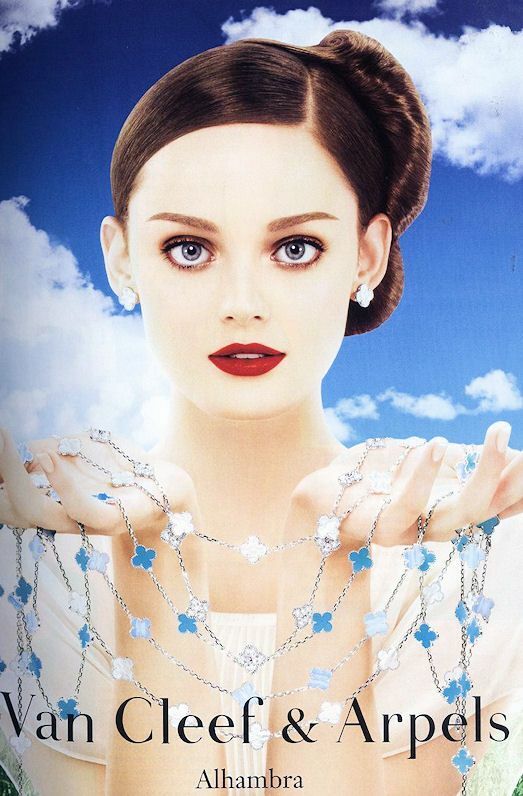 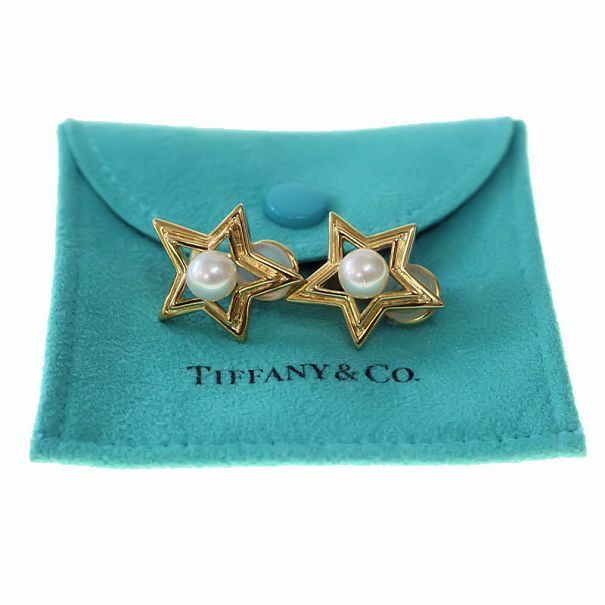 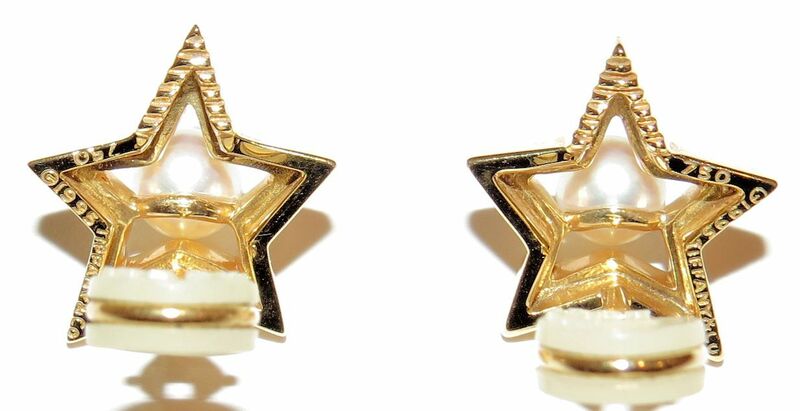 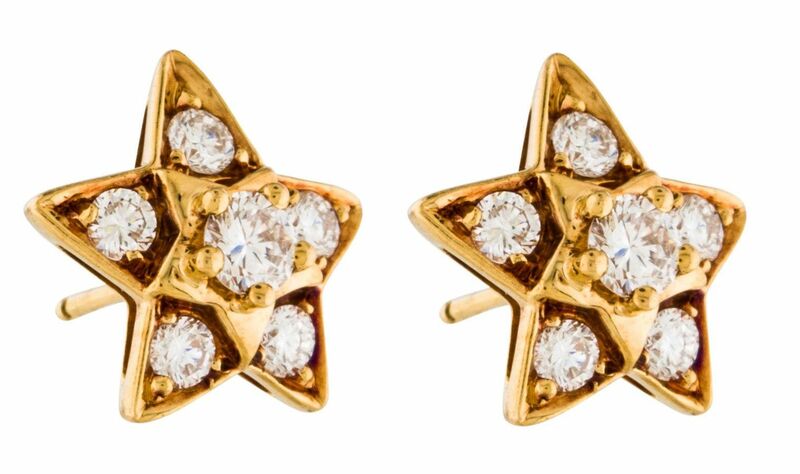 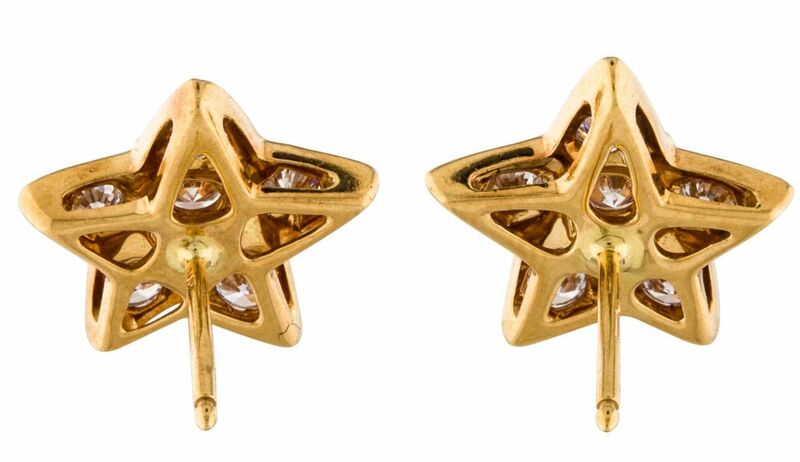 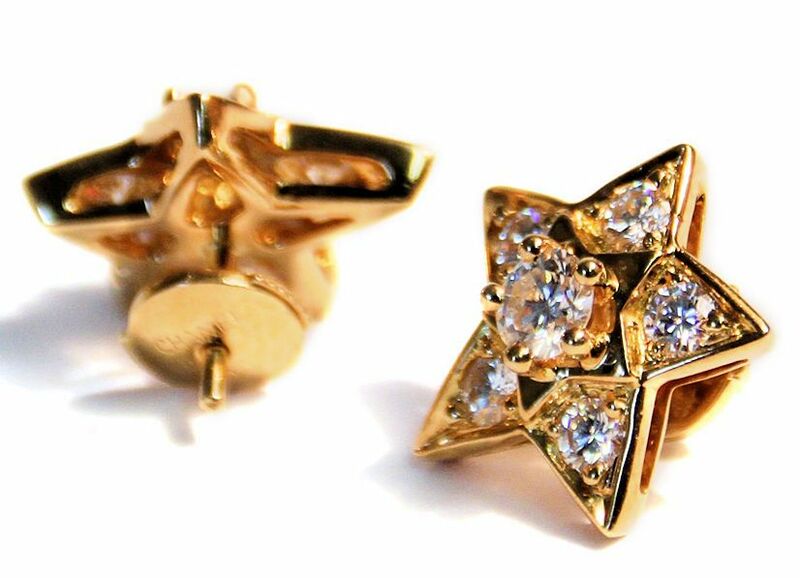 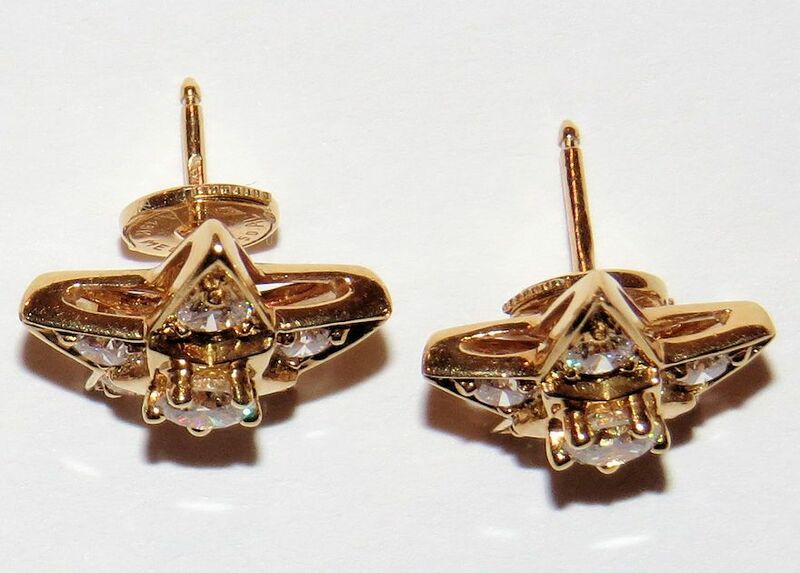 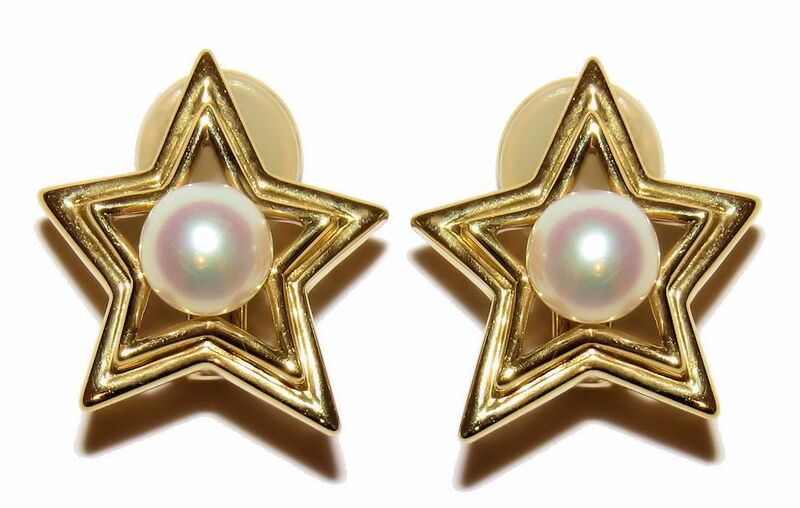 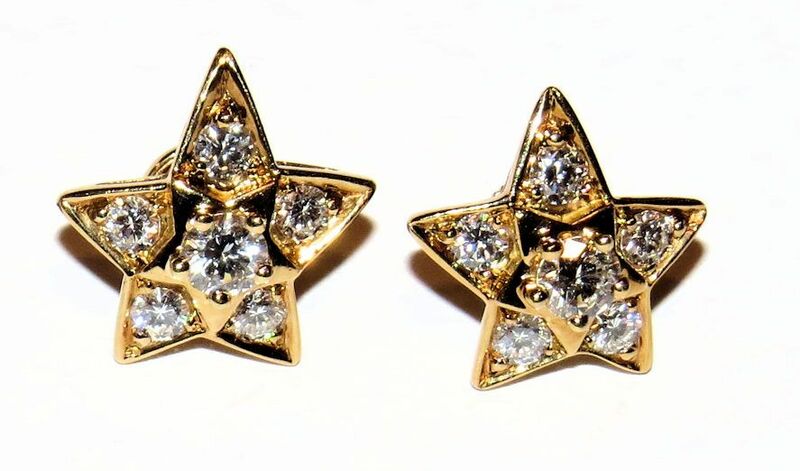 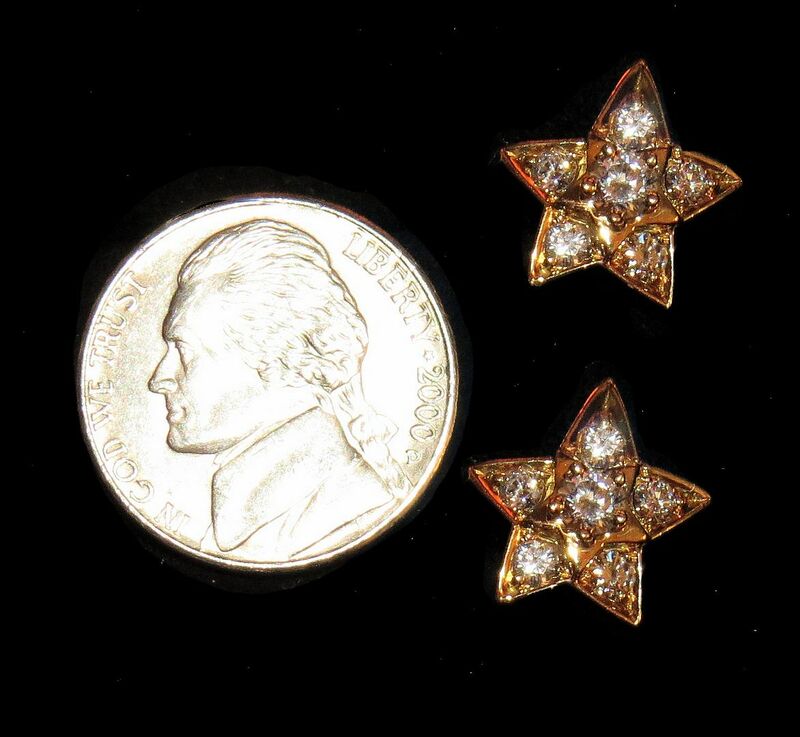 In MINT condition from Chanel's Fine Jewelry collection come these highly coveted and SUPER RARE 18K yellow gold and diamond Etoiles star earrings from the Cometes collection. 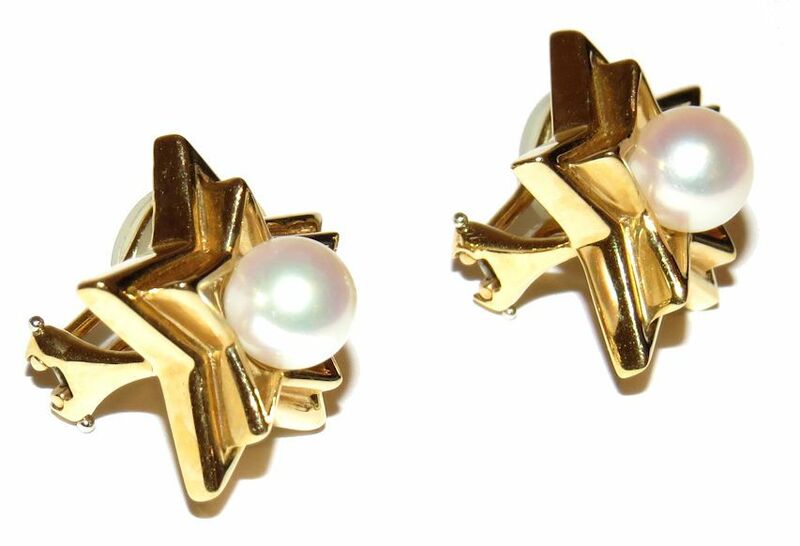 Chic, fresh, and fun. 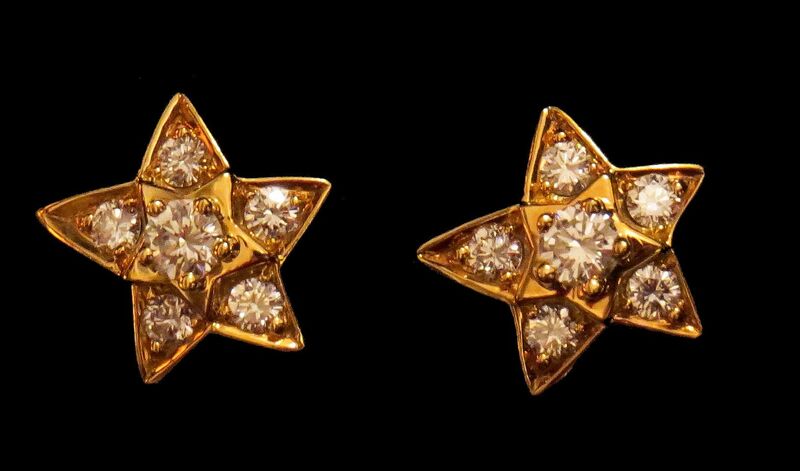 In 18K yellow gold, they are star shapes each with a single round brilliant cut diamond surrounded by five smaller diamonds on each earring. 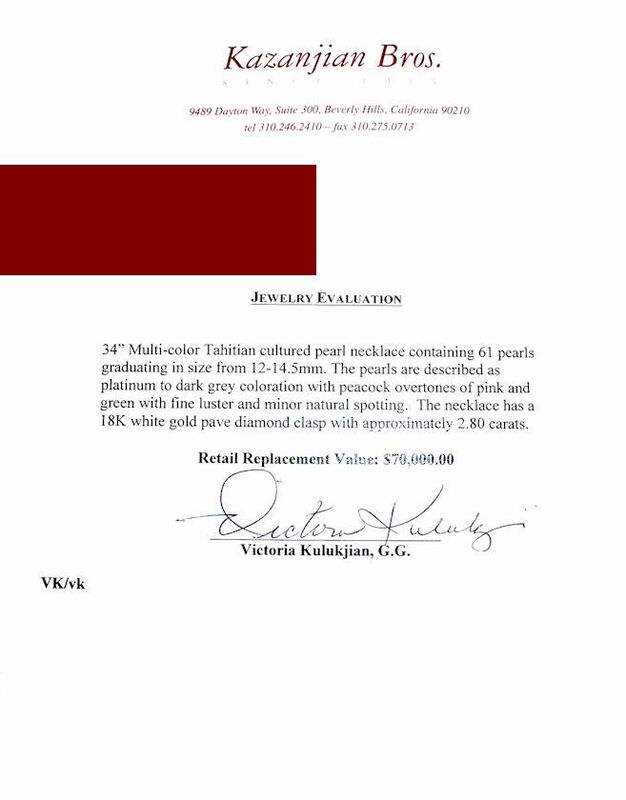 All diamonds are VVS clarity, color F-G. 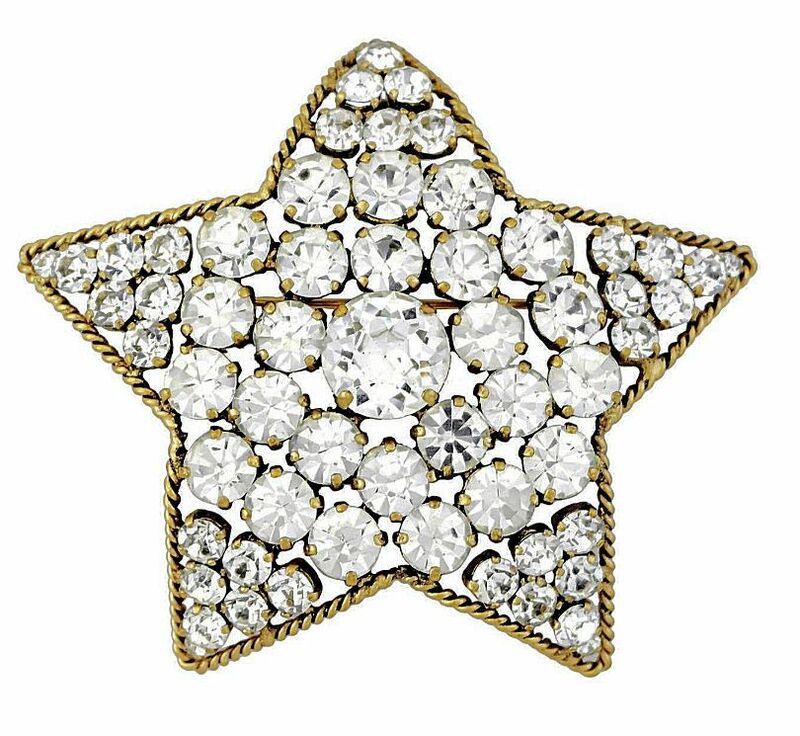 This Etoile star stud measures approximately 14mm x 13mm and have approximately 1 carat of VVS/EF round brilliant diamonds. 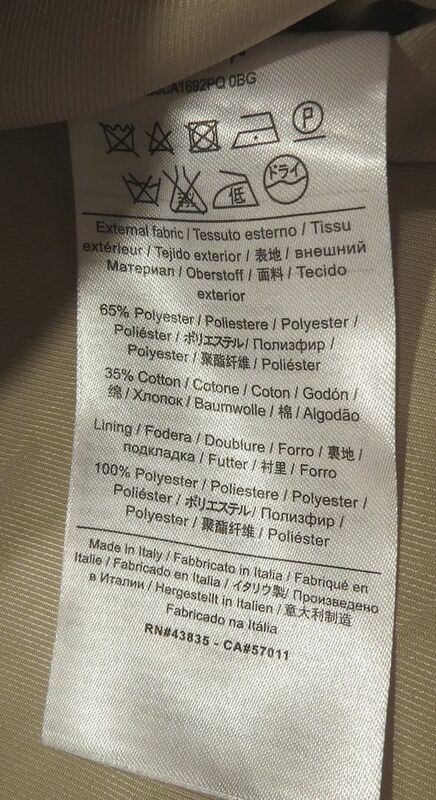 These are NOT the small size! 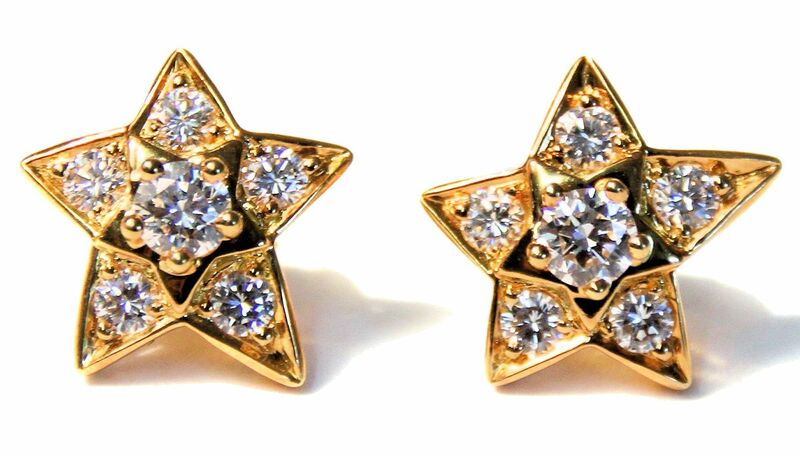 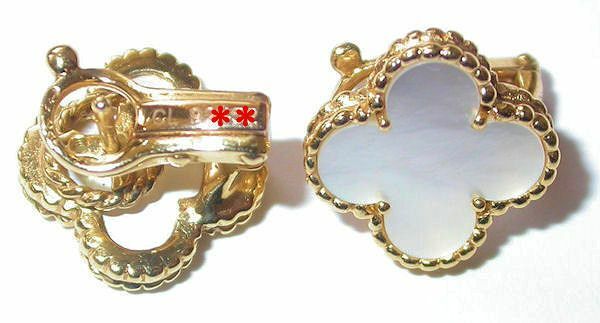 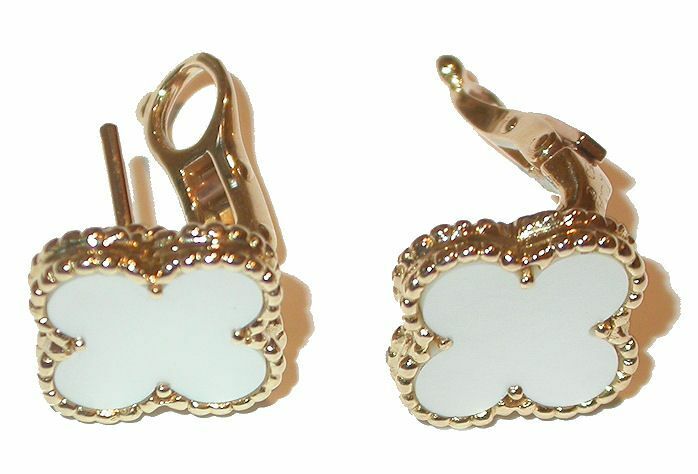 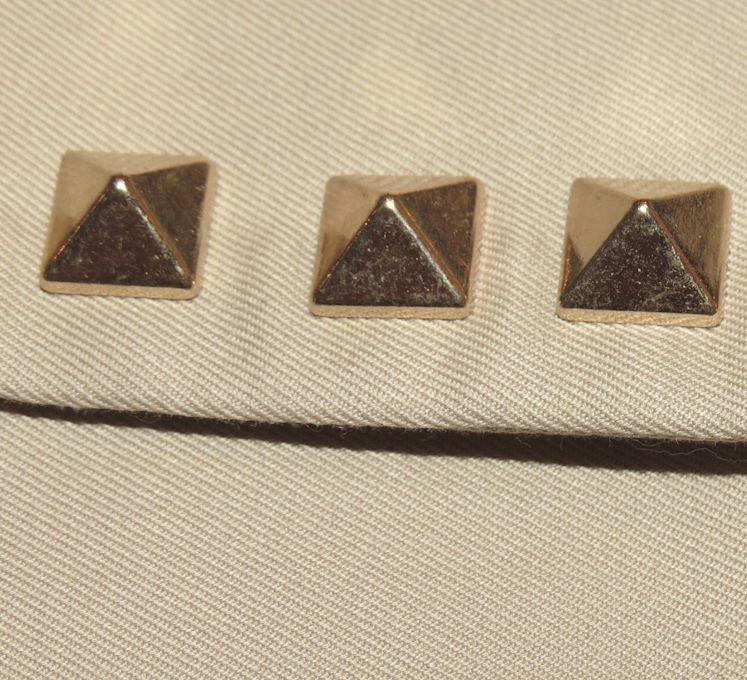 Finding these in 18K YELLOW gold is a feat as there were very few pairs issued in yellow gold. 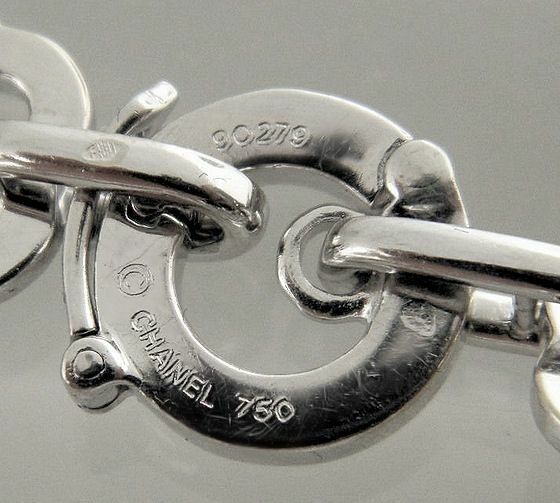 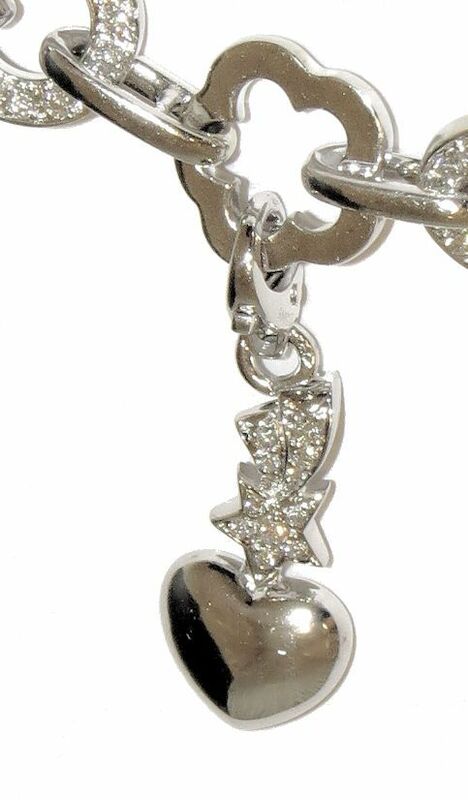 Signed and hallmarked, they are guaranteed authentic Chanel Fine Jewelry earrings. 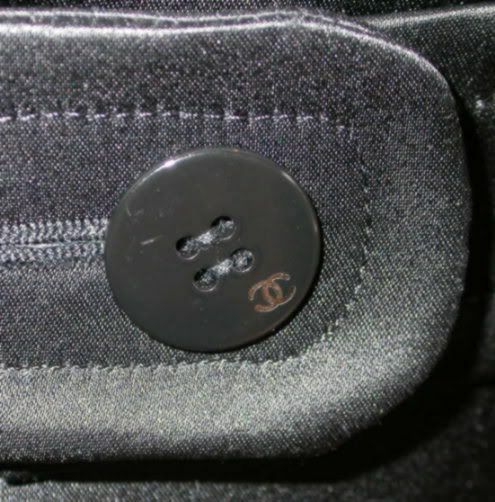 Classic-Chic is NOT an authorized dealer or agent of Chanel or any of the other designers whose goods are offered on this site. 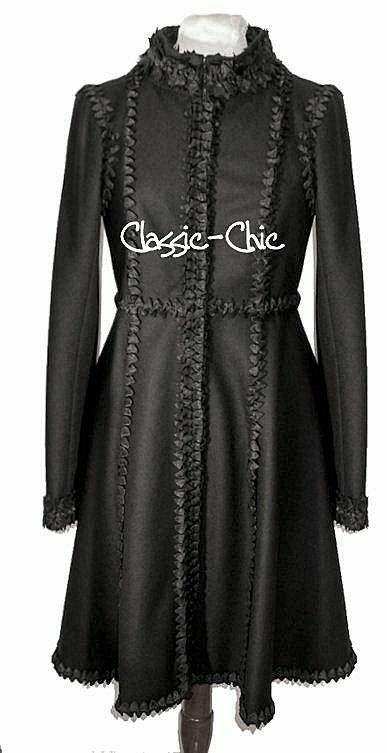 Classic-Chic is the sole warrantor of all brands sold on our website. 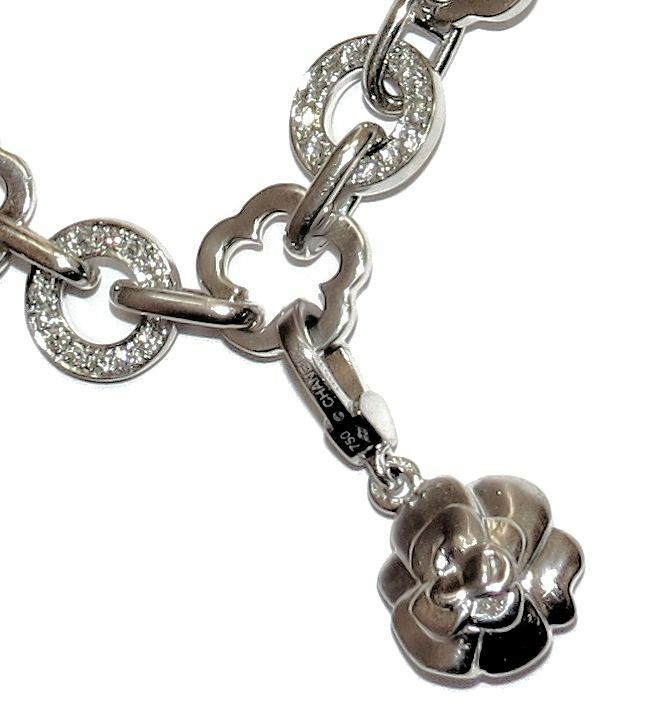 Classic-Chic is not and does not claim to be, an authorized dealer of any brand advertised on our website nor do any of these brands endorse or participate in this website.